My main co-teacher had told me on Friday that she'd be on business trips Monday through Wednesday this week, the three days that I co-teach with her every week. But she also told me what lessons to cover, so I prepared and was expecting students today. My sixth grade class didn't show to my first period, so I messaged their homeroom teacher a few minutes after the bell with "English class today?" Ten minutes later I got a "No English class today" back, so I settled back in at my desk until the next period. Same thing happened, but this class's homeroom teacher responded sooner with a "English class push back next week ^^" which made me wonder if I'll get to see the sixth graders at all tomorrow, in what would be my last class with them. So I didn't teach any classes today, but did get lots of blogging done. My other co-teacher brought a scale from home for me to borrow, as I'd asked him to do last Friday. So Monday night I started loading things into the suitcase, which I have to keep at 15 kg or less for my flight to Tokyo a week from today. On the walk home from school I also transferred everything out of my main Korean bank account into my Korean Citibank account, which I can transfer home. I have leftover cash from my grandma and sister's visit that should get me through the weekend. No sixth grade classes came today, which I figured would be the case after what happened yesterday. Although I'm bummed about not getting to see any of the sixth graders for a final class, I'm glad to have had the blogging time, as it's really time consuming and I wouldn't have been able to finish so many posts about my grandma and sister's visit had I taught regular classes. I'm also glad that I had my main co-teacher take a picture of me with each sixth grade class back in July right before summer break. I've learned by now that you should never leave anything to the last day, because you never know what sort of last-minute changes will come up, so that's why I wanted class pictures even though it wasn't my last day teaching. I never would have guessed that those classes back in July would actually be the last time I'd have the sixth graders, so it's a good thing I planned ahead. My main co-teacher texted me this afternoon and said "Sorry you had a hard time with 6th grade," which I think is supposed to mean sorry they didn't come to class. She told me again which lesson to do with the third graders tomorrow, so I think they will come. Some computer guy was in our classroom near the end of the day, but when I left my co-teacher said it worked and the computer guy was finished. Since there was a computer person in here yesterday, I made sure the classroom computer worked with plenty of time to troubleshoot before class. I'm all set up, my third graders start coming in the room, so I turn on the TV and hit play on the song and... no sound. What?! Aghhh. My co-teacher had already left to teach his fourth grade class in their classroom, but he usually fixes computer problems. Luckily this third grade class's homeroom teacher is the one with the best English in the school (my opinion), and he was still in the room. So he tried to get the sound to work. It was taking a while, so then he tried to keep the kids occupied with Simon Says. After he finished explaining it, I took over giving the Simon Says directions while he kept trying things with the computer. Fifteen minutes into class I was telling him that's okay, I'll just change plans and teach without... and then he got it to work. So class went really fast and we didn't cover everything we were supposed to, but that's okay. At the end of class I said that on Friday I leave. Their teacher was back in the room at this point and translated into Korean. The kids made comments in Korean, and their teacher told me that the kids hadn't known I was leaving, and that this was their last class with me. So he had them say thank you, and then some came and gave me hugs or high-fives after class, and then they were off. My next class wasn't there when the bell rang, but their classroom is right down the hall, so I just waited a few minutes. Then my co-teacher came back to the English room, though he should have been with a fourth grade class, and said "Oh yeah, there are school elections today." Ah, so no second period? No. Then I had regular third period, and that second period class got pushed to fourth period. Today was my last day teaching with my Thursday/Friday co-teacher, as he'd be gone tomorrow when we usually teach together. He had us do a bit of book stuff, and then at the end the kids all had to write me letters. Our fourth graders aren't at the level where they could organically create a letter like that, so my co-teacher wrote one that everyone basically copied. He put out markers and crayons so students could decorate them, it was sweet even though it was obligatory. I learned today that starting September 1 all schools in our province will have a new start time of 9:00 (instead of 8:30), and the first period will start at 9:10 (instead of 9:00). Ending time for the students will push back 10 minutes, from 2:30 to 2:40. Oh also, I'd translated a message from the messenger earlier in the week, and it said something about a social dinner tonight. I figured it was a goodbye dinner to my main co-teacher and myself, but nobody ever specifically invited me or told me about it. My other co-teacher had mentioned last week that we should have some sort of goodbye party, and then earlier this week said we would celebrate with all of the teachers - but that was it! He never gave me the date or time or details. Had I not seen and translated the message, I wouldn't have had any idea this was going on. Then my co-teacher told me we'd to to my apartment that afternoon for a check, you know, to make sure the items that the school owns were all there and in good condition. Whoops, wish I would have known that someone would be coming into my apartment! I'd thought the check would be on Friday. It wasn't too bad, but it could have been better - still somewhat embarrassing how I'd left the place in the morning. So we left school at 3:35 to go to my apartment, and finished well before 4. Amazingly, my co-teacher said he would come back to the apartment at 5 to pick me up for the dinner. Ah, the dinner! That was totally the first anyone had told me of the dinner, at 4pm the night of, but I played along that I'd known all along. So then I had a nice hour at home, during which I did a quick load of laundry and a bit of blogging. Although my co-teacher was gone today, he said to do something with the fifth graders like what we'd done yesterday with the fourth graders. So I decided we'd spend half the class learning/singing Connie Talbot's version of "Count on Me" - which is super popular with all our kids, by the way. And the second half they could write me a little letter like we'd done the day before. So I prepare, get the class set up, bell rings, no students. Are you kidding me? It was Monday and Tuesday all over again. I waited a few minutes, and then messaged their teacher. I could see on the messenger that their teacher wasn't at his computer at the moment. Was the class somewhere else? The reason why I hate when this happens (though it's a rare situation, and didn't matter anyway because this is the last time it could ever possibly happen) is because I worried what my main co-teacher would say if she happened to walk in and see that I didn't have a class. I imagined a "Why didn't you ~?" But of course I've never been given the protocol for what to do when you're teaching without a co-teacher and the class doesn't come, since that's such a rare situation. Anyway. The teacher finally saw the message (the program tells you when it's read) maybe 15 minutes into class, but didn't reply that they weren't coming until maybe 30 minutes into class. I had to send a message to the next two periods as well, but their classes ultimately came, just a few minutes late. One student during second period asked for my autograph, and then everyone in the class wanted me to sign their book or a piece of paper. One boy wanted me to sign his pencil case, and a few boys joked about me signing their shirts - but I wouldn't sign the pencil case. It got around fast, and the following fifth grade classes, and later in the day many third graders and random other students came in for my autograph. I got some great practice with signatures! I felt like a celebrity. And in a snap the day was done. The last one. My sister and grandma came to visit me in Korea during my summer break. We were together from August 8 - 20, 2014. Here are the retellings of Day 1, Day 2, Day 3, Day 4, Day 5, Day 6, Day 7, Day 8, Day 9. Day 10, and Day 11. It had rained some during the night before our last day in Hong Kong, which was awesome because the temperature cooled down some in the morning, making it more bearable to be outside (though, as always, it was still hot and humid). 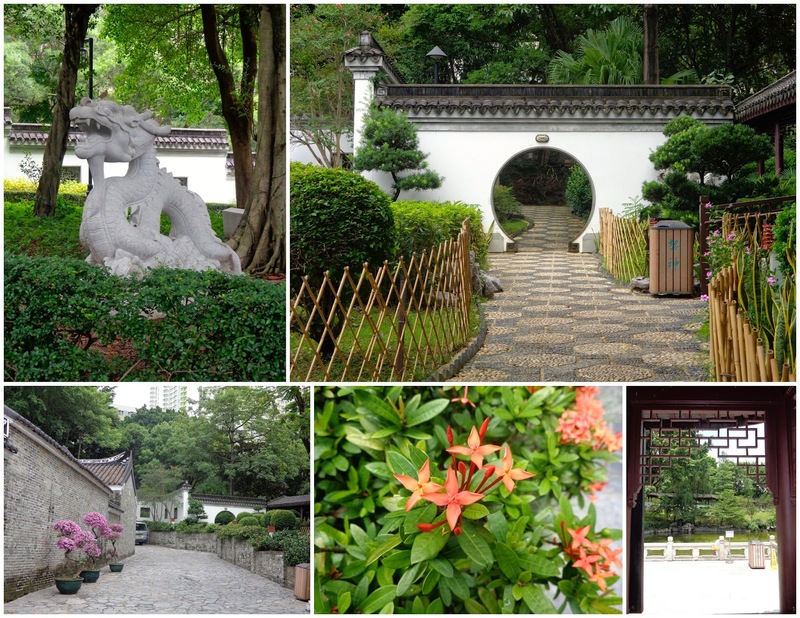 We started our day at the Kowloon Walled City Park, one of my favorite things we did in Hong Kong. 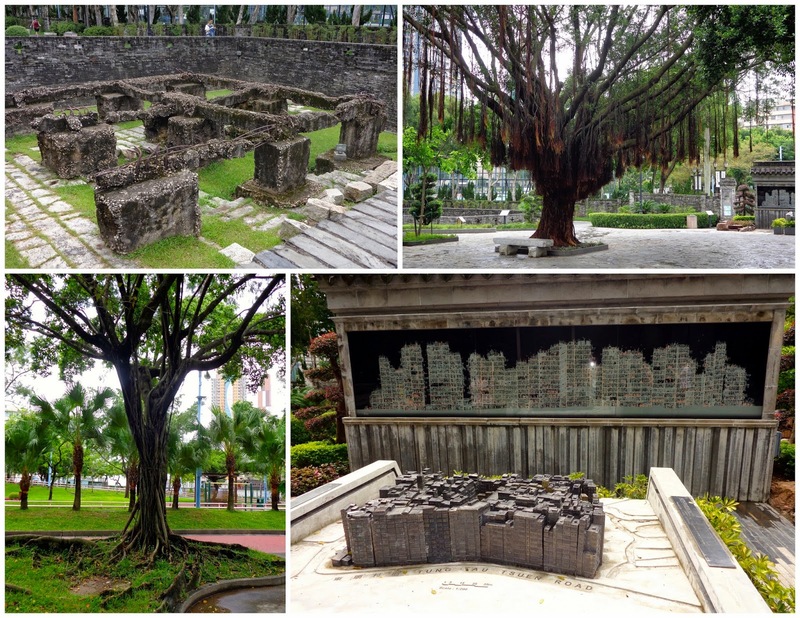 I had never heard of this park before it was suggested to us as a possible itinerary item, so I was completely oblivious to the incredible history (and existence) of the Walled City before it was torn down and turned into this park in the early 90s. The Walled City, covering about the space of one city block, somehow never became fully under British rule when they leased the city from China for 99 years starting in 1898. The actual walls were torn down by the Japanese when they took over the city during WWII. The stone from the walls was used to expand the nearby airport. The Walled City really started to boom in the 1960s, but there were no foundations under any of the buildings since the area was completely unregulated. In some of the interviews we watched at the museum in the middle of the park, previous residents said they worried that their building would collapse. It would have been a domino effect, as the buildings stood one right after the other. 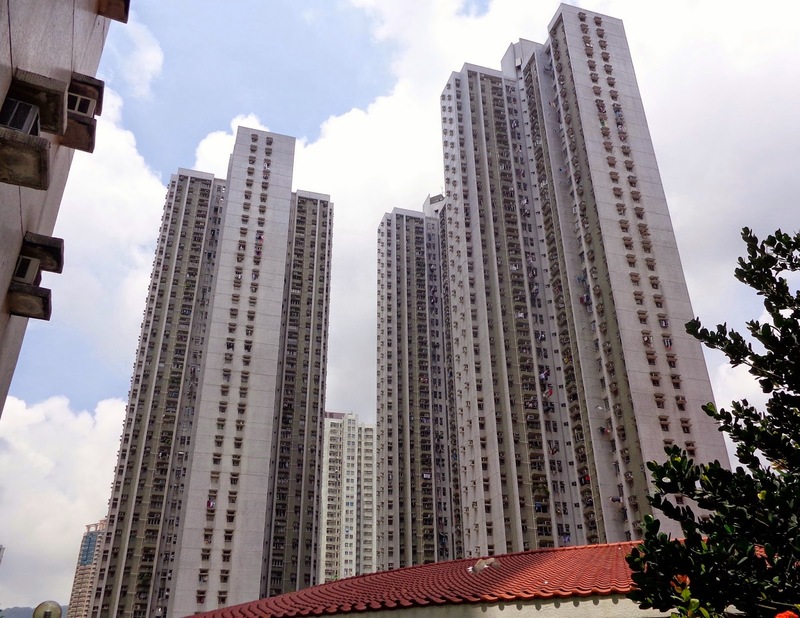 In the 1970s, the buildings were reaching 10 and 14 stories high, which brought airplanes super close to the roofs when taking off and landing at the nearby Kai Tak airport. 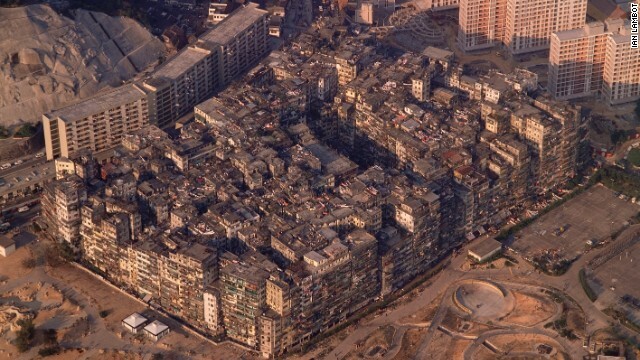 The Walled City has been called the densest place on the planet, with 33,000 people living there at the time. Since this block was not under government rule, they didn't have running water like the buildings outside of the wall. It was also a place where gambling, prostitution, and drugs could thrive. So it was very much considered the slums, but it was entirely self-regulated and functioning. 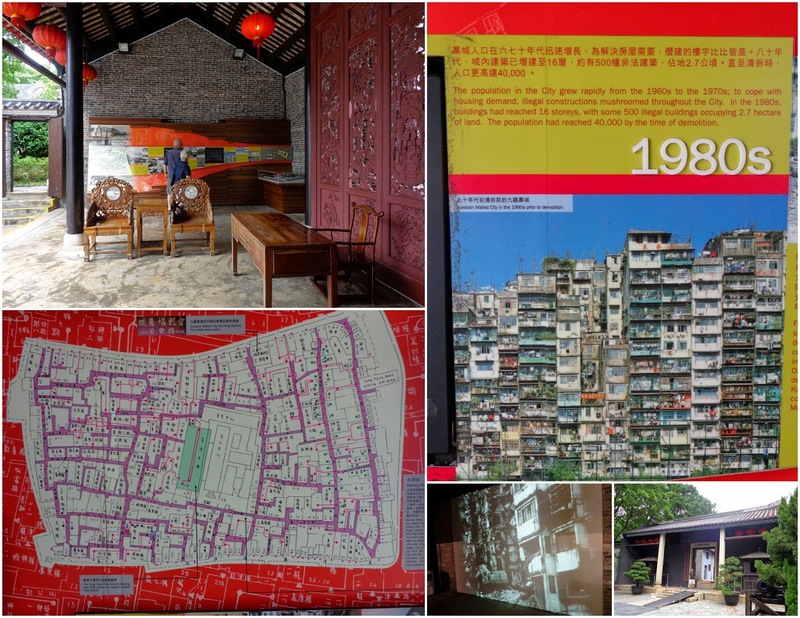 There was an incredible sense of community; that's how the Walled City operated. They had dentists, doctors, butchers, restaurants; it was a place that operated on its own, without the infrastructure of the surrounding city. Although the dentists and doctors were not licensed, and there were no food regulations for grocers or restaurants, the people helped each other and started businesses wherever there was a need. There had been previous attempts to close the Walled City, but it finally happened in 1992. The government compensated all of the the families and businesses that were forced to leave. In April of 1994 demolition was completed, and the building of the park began one month later. If this Walled City interests you as much as it did me, I highly recommend checking out the Wall Street Journal's interactive site all about the Walled City. See a timeline of the area, photos from various decades, and hear stories and interviews from the previous residents. 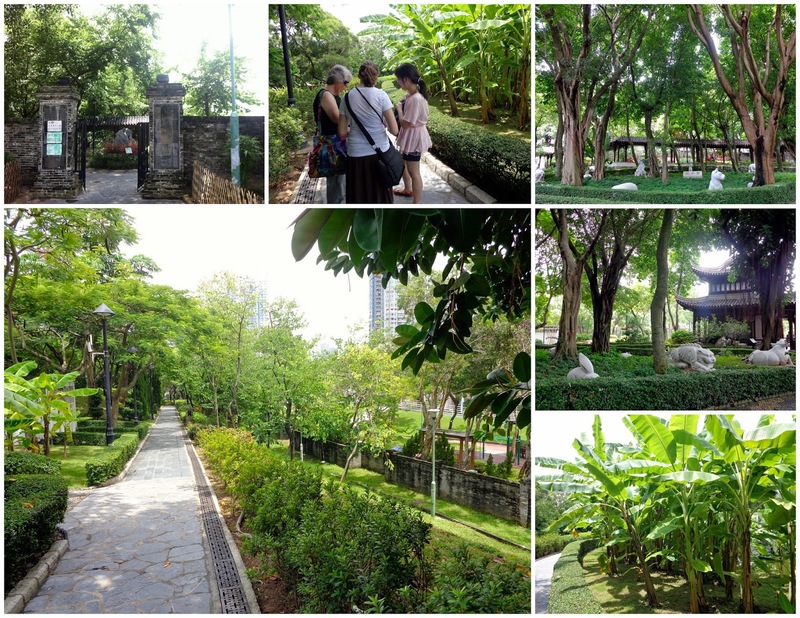 Although the Walled City was far more than the drugs that came out at night, and many were sad to see it destroyed, it's really nice that they could turn the whole area into a peaceful green space in the middle of the hustling city. In the middle of the park there's a small museum about the Walled City. I loved reading all of the information, seeing photos of what it used to look like, and watching interviews of previous Walled City residents. After spending a few hours in the park, we took a taxi to a nearby mall for some shabu shabu lunch. there wasn't rice paper to make spring rolls, and you don't cook noodles second and later rice as you do in Korea. I think it goes without saying that we left that meal completely full, just like all of the others. It had rained while we were in the restaurant, but luckily the mall was connected to the metro. 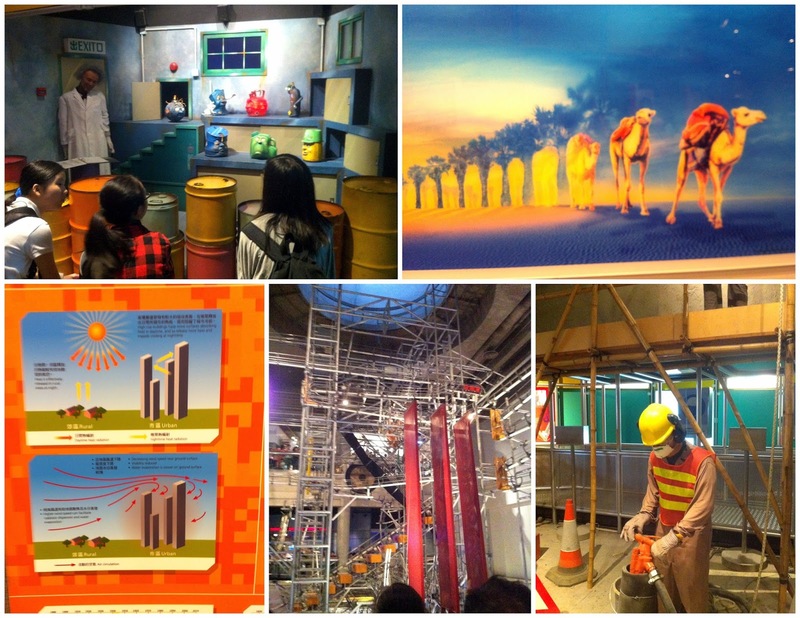 We still had many more hours before our late flight (12:45am), so we went to the Hong Kong Science Museum for a bit. The science museum was very much kid-centered. It was so interactive with tons of technology; a child's paradise. 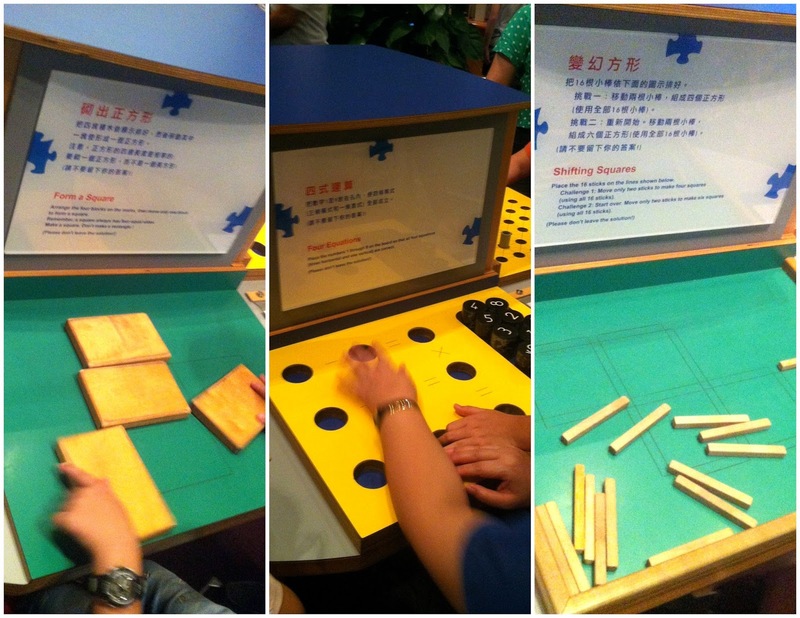 The part I liked the best were these interactive puzzles. You know, like get these blocks to fit inside this box, or remove two sticks from this setup to leave x number of boxes. And then you got to play with the pieces until you figured it out (or until you looked at the hint... and then the answer). And then we headed back to the hostel, grabbed our bags, and took the bus to the airport. Although we were many hours early, we really didn't wait much at all. After getting our boarding passes, going through security, finding a place to eat, having dinner, and having dessert, we really only waited at our gate for maybe 20-30 minutes. I was super tired though, and unfortunately didn't sleep at all on the flight. 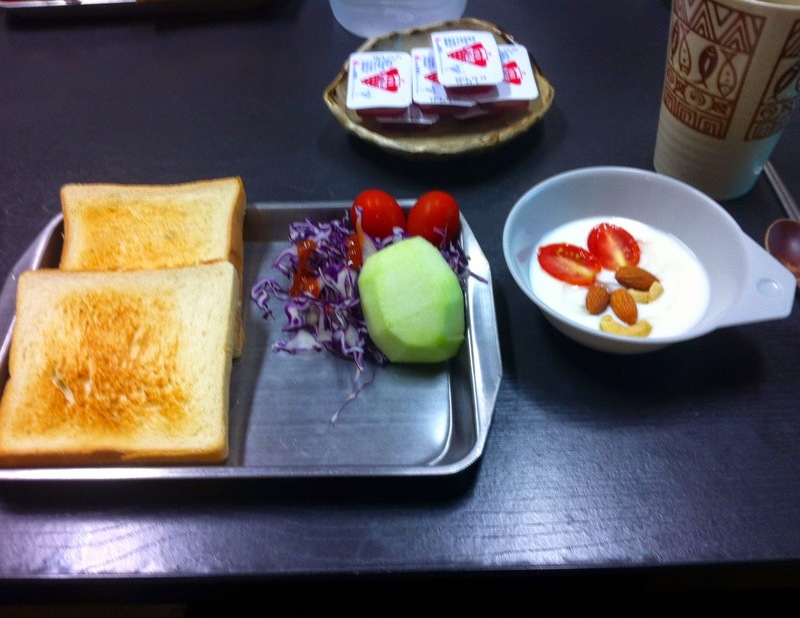 I didn't think we'd be served any food, but we were served an entire meal, plus the regular peanut snack and juice. Once we got to Incheon Airport (Seoul) early the next morning, I groggily left and headed into Seoul to catch my bus home, while Jacki and Grandma had to wait a few hours before their connecting flight to Chicago. By that point, as always, the two weeks seemed to have flown by. But it was nice to know I'd be seeing them again in less than three short months (and now it's just two!). Thanks for another successful visit and trip! 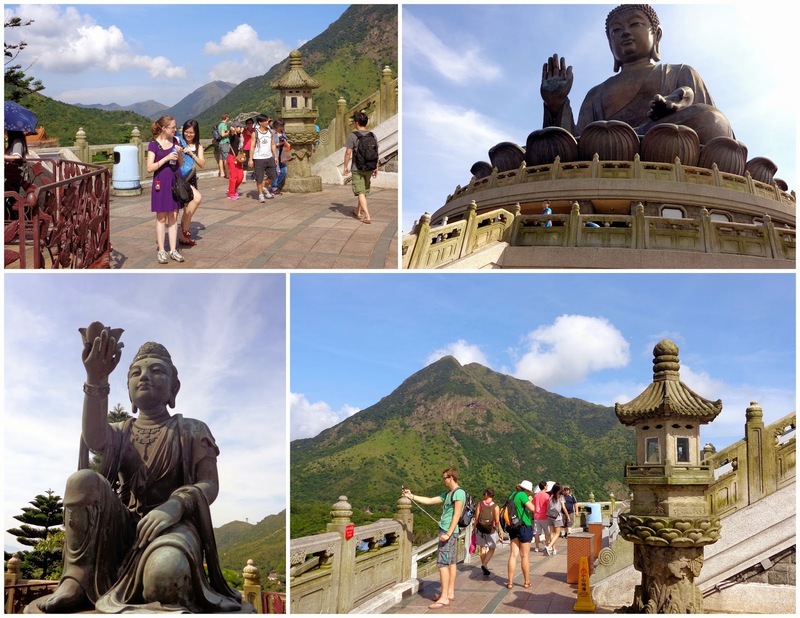 On Monday we hopped on the metro and met with Charmaine, Tom, and Charmaine's father to take a cable car up to see the Big Buddha. 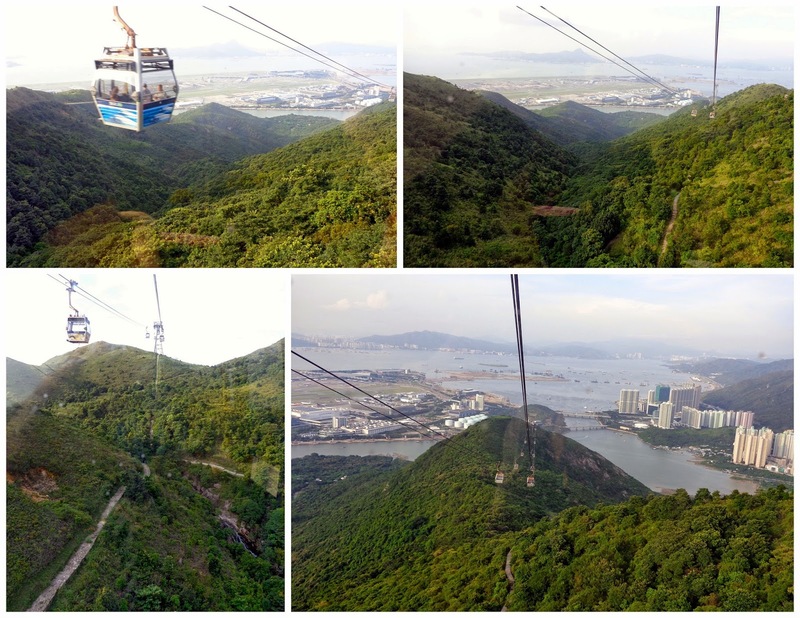 There were some amazing views from the cable cars. The windows made a terrible glare in photos, so I mostly just looked with my eyes. 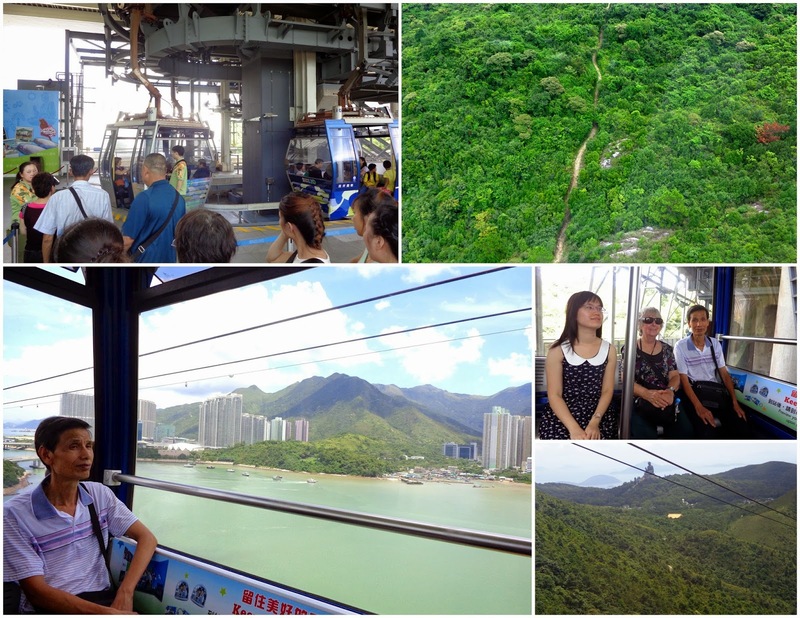 The cable car ride lasted about 25 minutes. We had another spectacular lunch, possibly my favorite food we had in Hong Kong, at the monastery. It was a vegetarian lunch with incredible flavors. As a result of the reading and learning about health this year (one of my new year's resolutions), I've been planning in the back of my mind to do a trial month with no dairy or meat once I'm back in the states this fall. 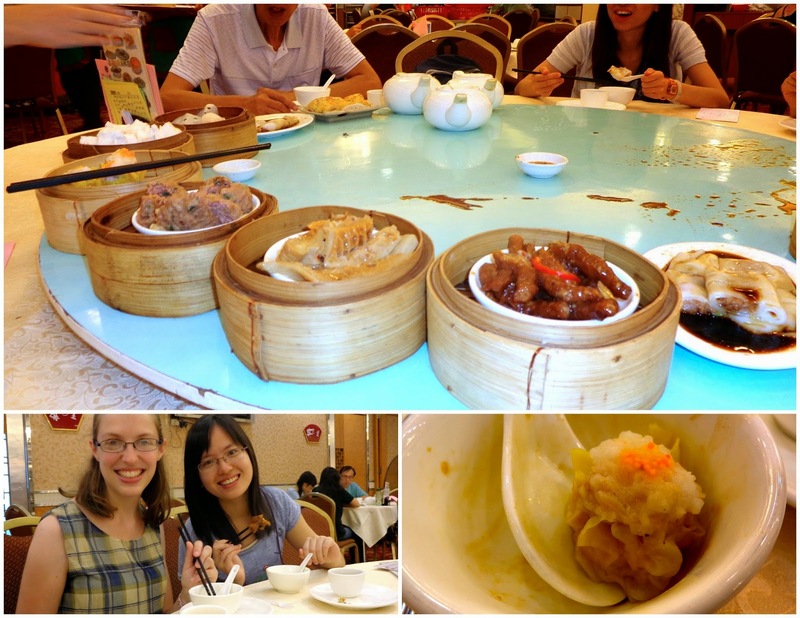 Our lunch that day got me really excited to explore more vegetarian and vegan foods. 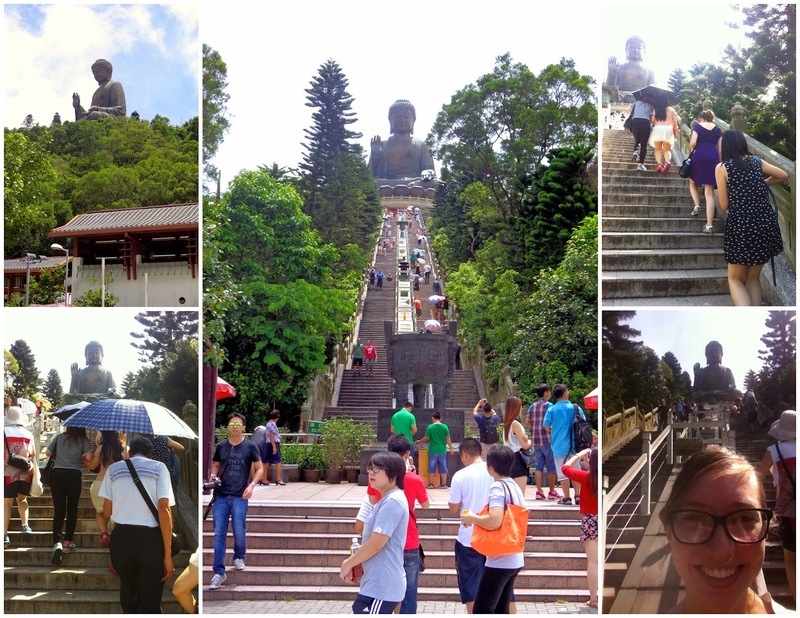 After lunch Charmaine, her father, Jacki, and I walked up the steps to the Big Buddha. They weren't steep and it really didn't take too long (or too much energy) to get up to the top. I took some pictures, which I'll share here, but I mostly tried to commit the view to memory without the camera in front of me. A photo could not do that scene justice, and I wanted to really appreciate the natural beauty - not just snap some quick pics and head back down, or try forever to get the perfect picture from my little point and shoot. 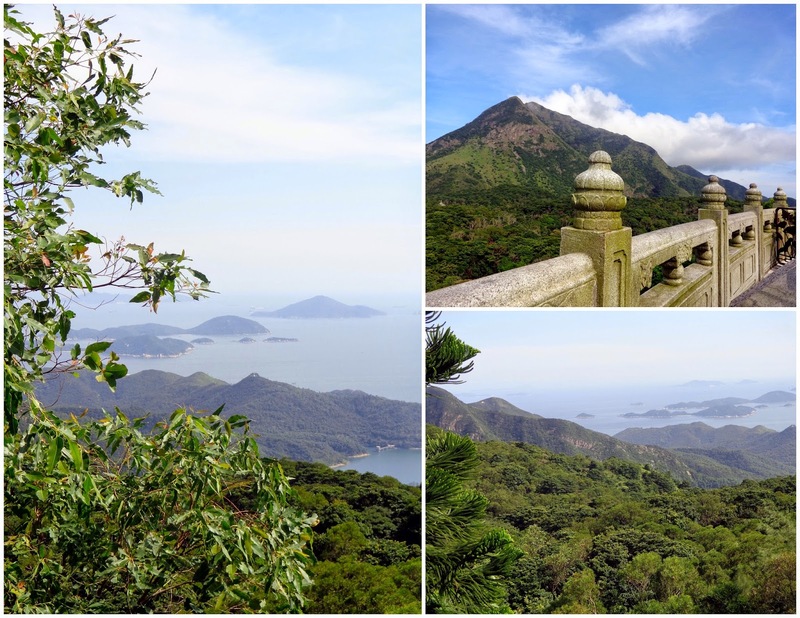 Green mountains surrounded most of the area, while a body of water with many small islands was visible from behind the Big Buddha. I loved it. After staring and staring, much wanting to give this beauty the time and appreciation it deserved, the pictures I took served as a reminder to me of these views I had enjoyed so very much. This time I wasn't trying to capture it, as most pictures aim to do, but rather I just wanted an aide to help me remember - if that makes sense. And then it was time to go back down and meet up with Grandma and Tom. We made our way back to the cable cars (~17:30), whose line had about a thirty minute wait. When we got back to the metro station it was past 6, and we decided the three of us were ready to make the trip back to the hostel and call it a day, instead of heading to do something else with Charmaine and Tom. We also needed to pack, as Tuesday would be our final day in Hong Kong. My sister and grandma came to visit me in Korea during my summer break. We were together from August 8 - 20, 2014. Here are the retellings of Day 1, Day 2, Day 3, Day 4, Day 5, Day 6, Day 7, Day 8, and Day 9. On Sunday morning Grandma and Jacki went to church, while I was determined to walk back to Temple Street where we'd had dinner the first night, and then buy some postcards from one of the many stands. That's when I learned that Temple Street is a night market, as the whole place was deserted. 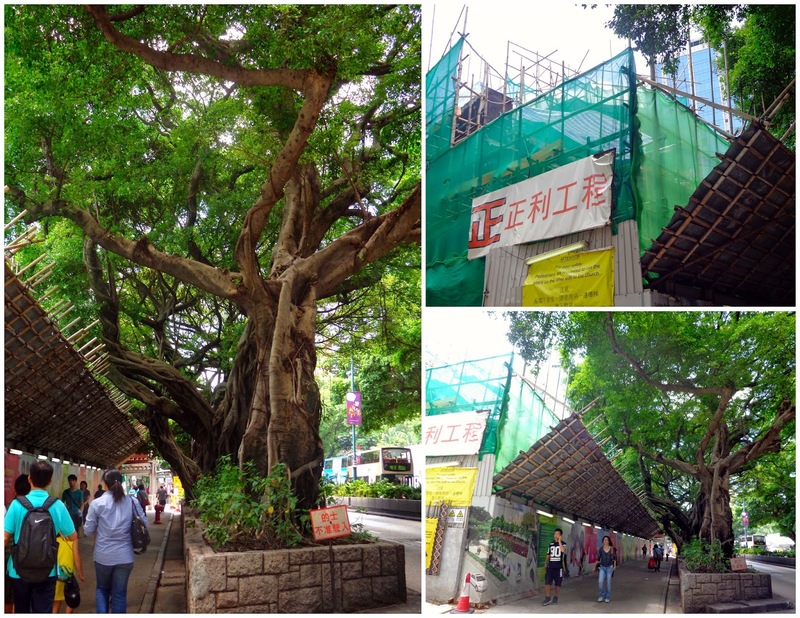 Walking back, I noticed a construction project that was using bamboo wired together as scaffolding. I'd see this many more times while in Hong Kong. 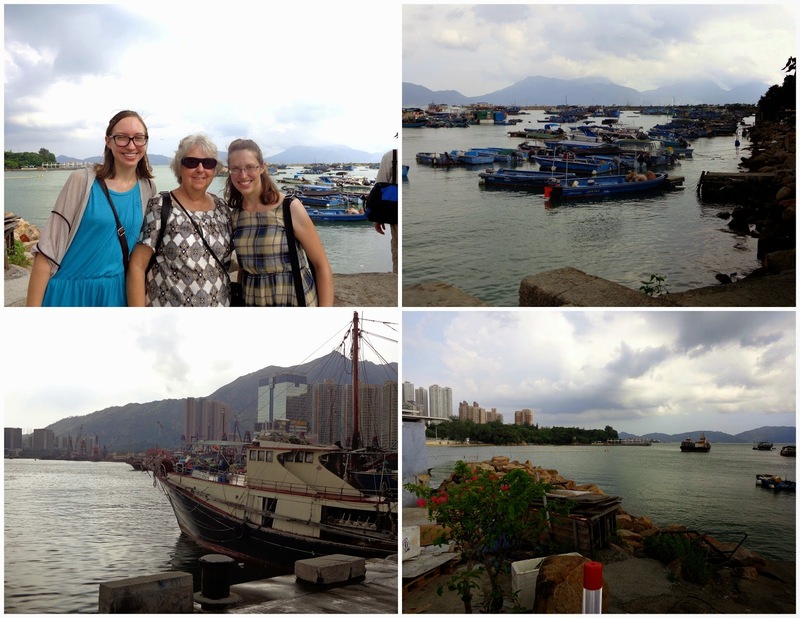 Grandma, Jacki, and I then walked down to the shore - where you can see across to Hong Kong Island. It was super, super hot today, even hotter than the previous days I'd say. So we escaped the heat in the Hong Kong Museum of Art. The area outside of the museum had just been redone in February. The current exhibition included a reflective sculpture, which reminded us of a mini Chicago bean. We left the museum around 14:15 and took a brief stroll along the shore, right behind the museum. 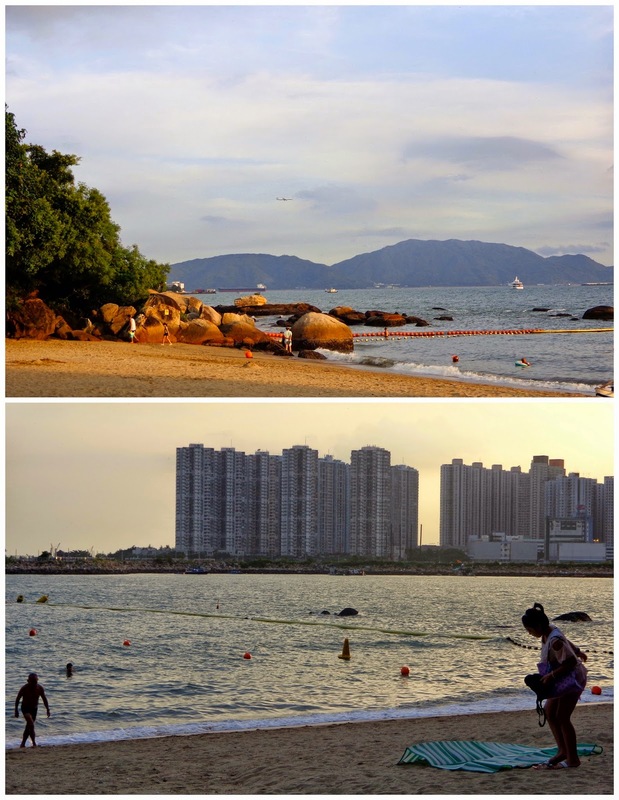 This location is directly across from Hong Kong Island. We had lunch closer to 15:00 in the YMCA building, the closest building to the museum. We enjoyed escaping the heat and feeding our grumbling bellies. 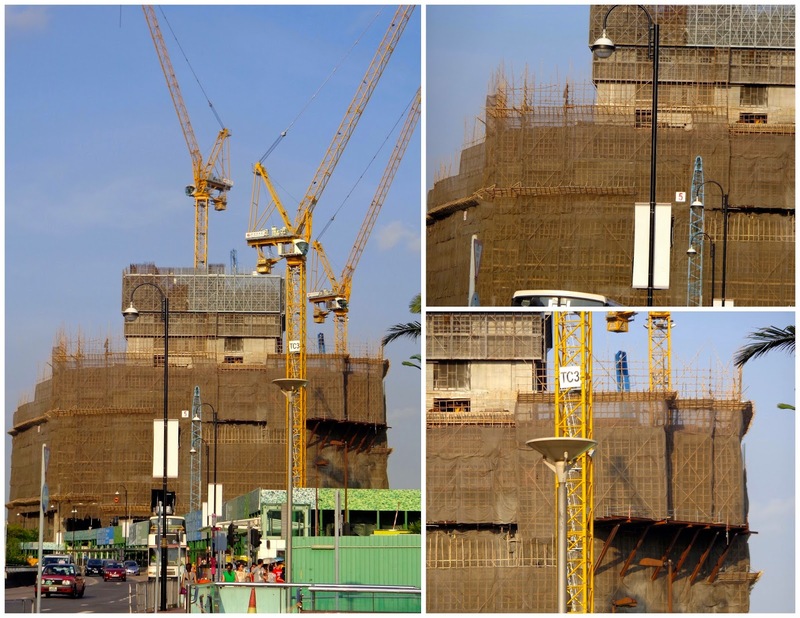 While walking back to the hostel after our late lunch, I saw a gigantic construction project. It was all held up by... you guessed it - bamboo. I found some postcards on the walk back, so I spent the next hour writing postcards back at the hostel. 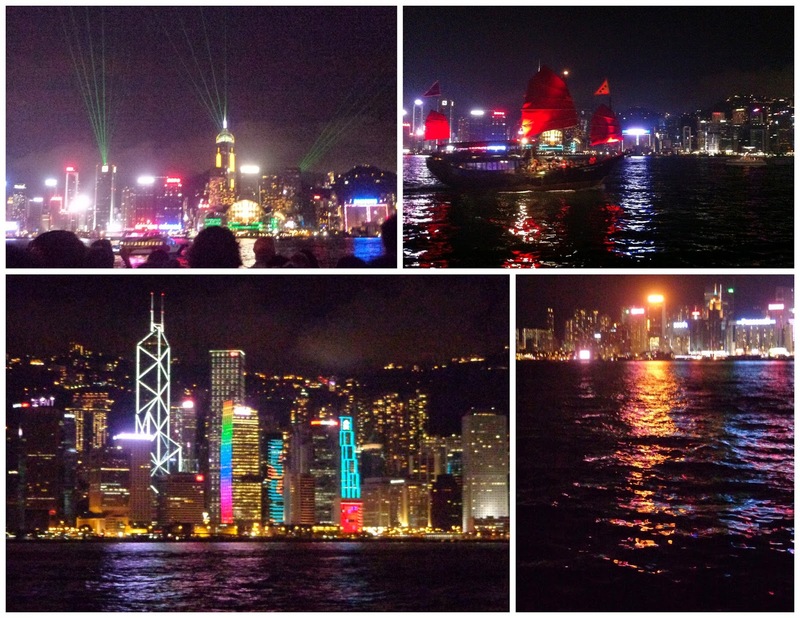 Grandma was in for the night, but Jacki and I left around 7:30 to watch the "Symphony of Lights" that takes place every night on the shore between Hong Kong Island and Kowloon. First Jacki picked up some ice cream from the place right by our hostel. 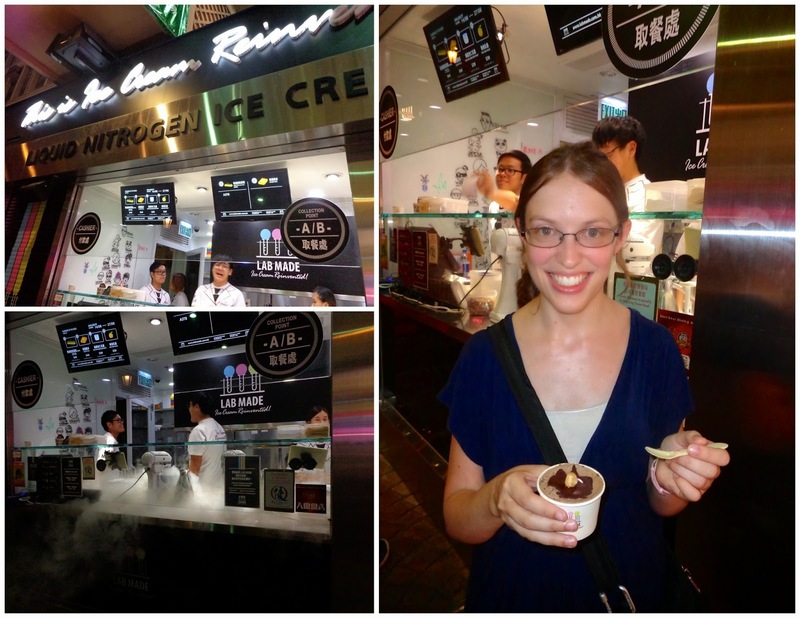 It's "Nitrogen ice cream," and is mixed right in front of you with a foggy haze coming out of the mixer that's reminiscent of dry ice. The Lights Symphony was around 15 minutes long. Music was playing from the speakers, and lights from various buildings on both sides would change to the beat. It wasn't all that easy to spot though, as most of the city lights were unchanging, and not part of the nightly show. But neat to see once, nonetheless. My sister and grandma came to visit me in Korea during my summer break. We were together from August 8 - 20, 2014. Here are the retellings of Day 1, Day 2, Day 3, Day 4, Day 5, Day 6, Day 7, and Day 8. The three of us took the metro for around 45 minutes to the last stop of a line, where we met up with Charmaine. 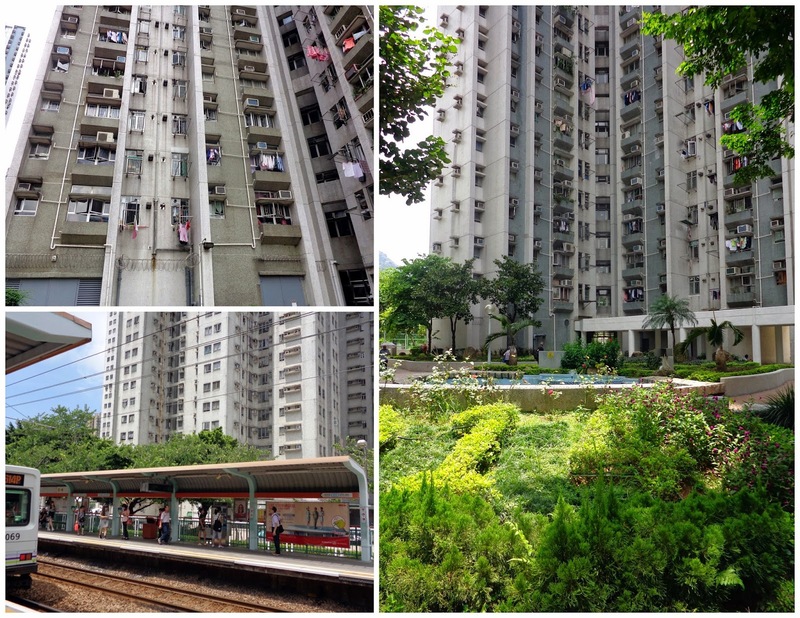 We got on a local train with her for just two stops, and then crossed the street to her family's apartment building. There are 35 floors in her building, with 10 apartments on each floor. Her apartment building was with a cluster of many other apartment buildings just as tall. 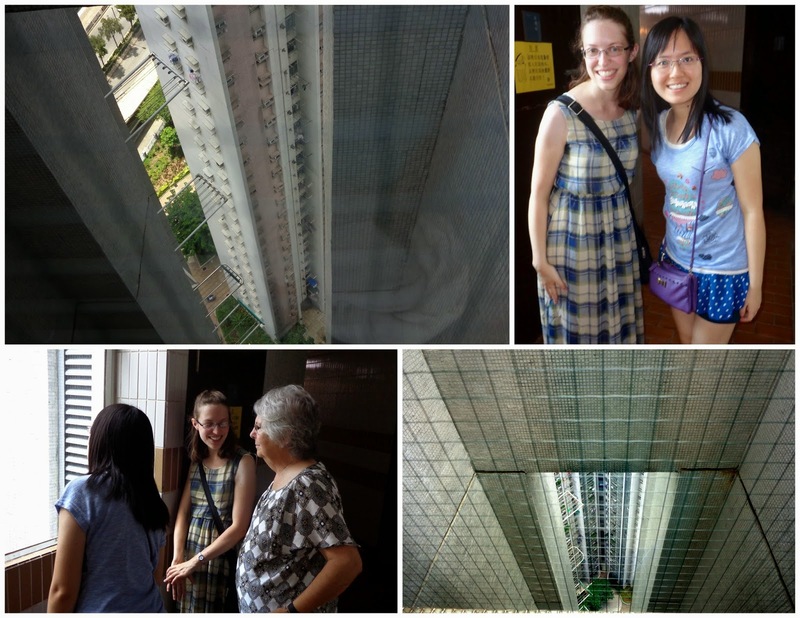 We took the elevator up to the 35th floor just to see what it looked like from way up there. The number of people everywhere (we were far out of "downtown" out here) was overwhelming. But I suppose that's expected in one of the densest places in the world. 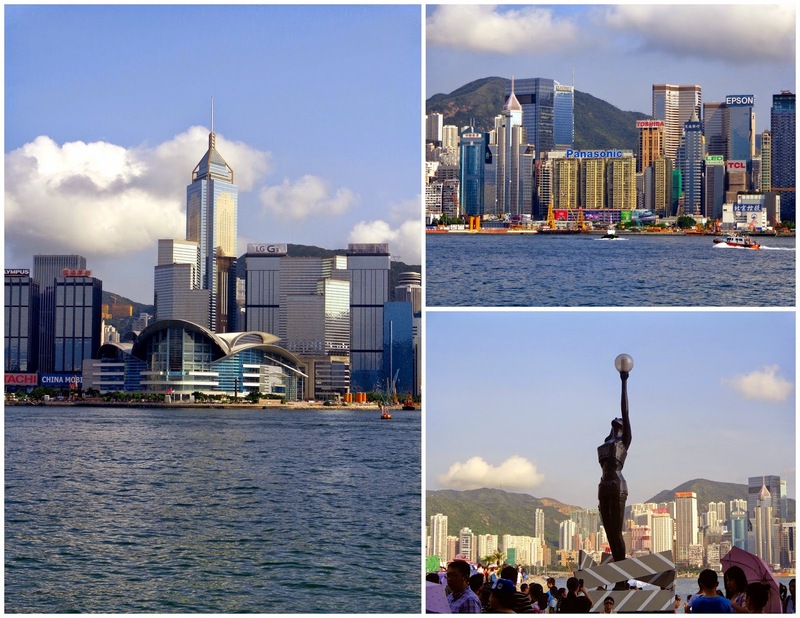 Wikipedia tells me that Hong Kong has over 6,500 people per square kilometer (over 17,000 people per square mile!). 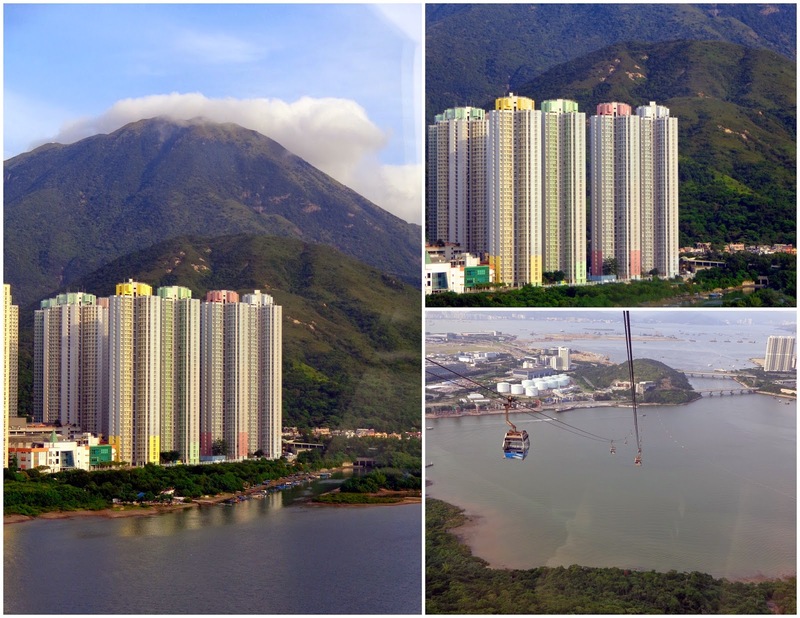 I had also read before coming that apartments are very small in Hong Kong, which makes perfect sense because of its density. Charmaine lives up on the 17th floor with her two parents, older sister, older brother, sister-in-law, and nephew (brother's son). That comes to 7 people, and there were only 3 small bedrooms in addition to the bathroom, kitchen, and living room. We were served tea in these tiny cute cups right away, and then Charmaine introduced us to "mooncake". Mooncake is eaten during the mid-autumn festival, which starts on the 15th day of the eighth lunar month. They sliced the dense circular cake into pie-shaped pieces for us to try. 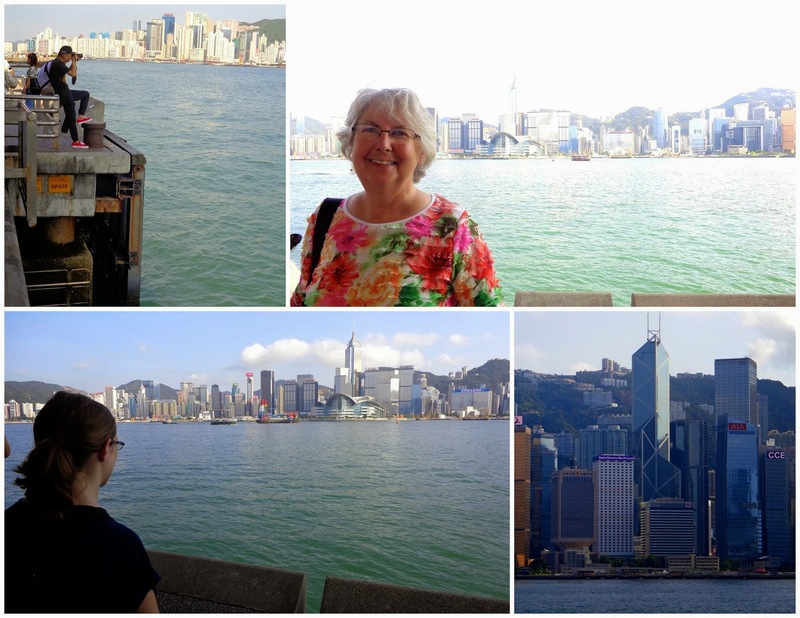 We chatted and learned more about Charmaine's family and life in Hong Kong. 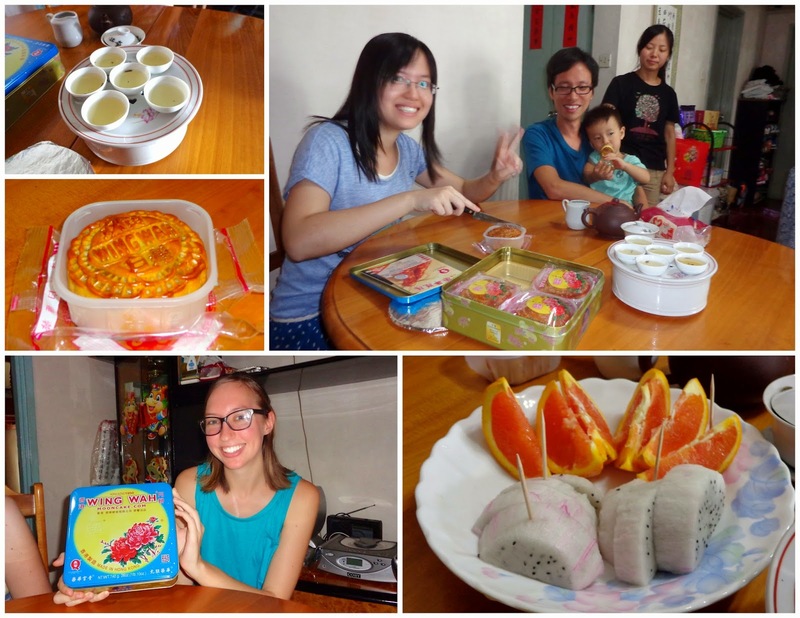 I noticed that my hunger for lunch was decreasing when we were then served dragon fruit and orange slices, and of course another piece of mooncake. Charmaine gifted us a box of four mooncakes and tea, as well as some scrolls written in Chinese. Her father had written one of them, as after retiring he began to study (and now gave classes in) this type of calligraphy/traditional writing - I'm not exactly sure what to call it. He wasn't at the apartment that morning, but he would be joining us for lunch in the afternoon. After more chit chatting and snacking, we left the apartment and walked to lunch. 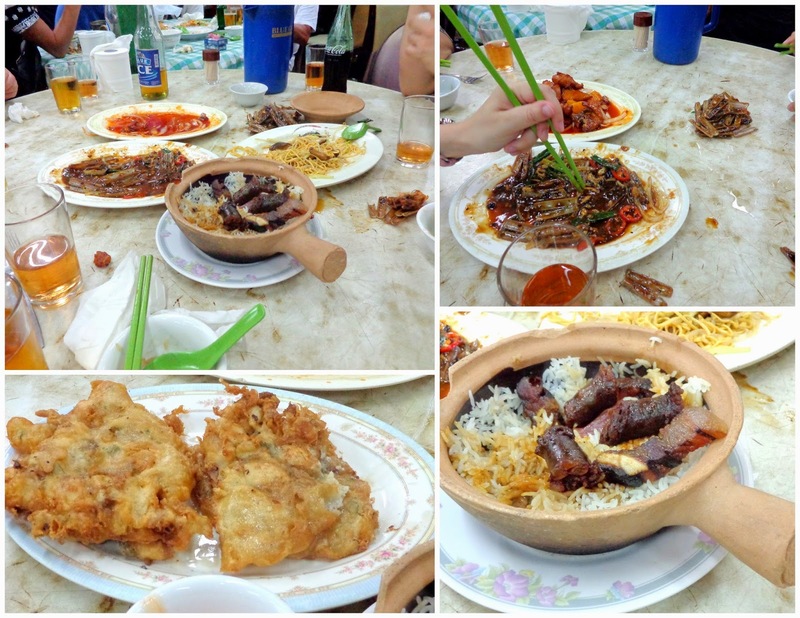 Our big round table had a gigantic Lazy Susan in the middle, which was absolutely necessary with how dishes are shared here (as is done in many other Asian cultures). 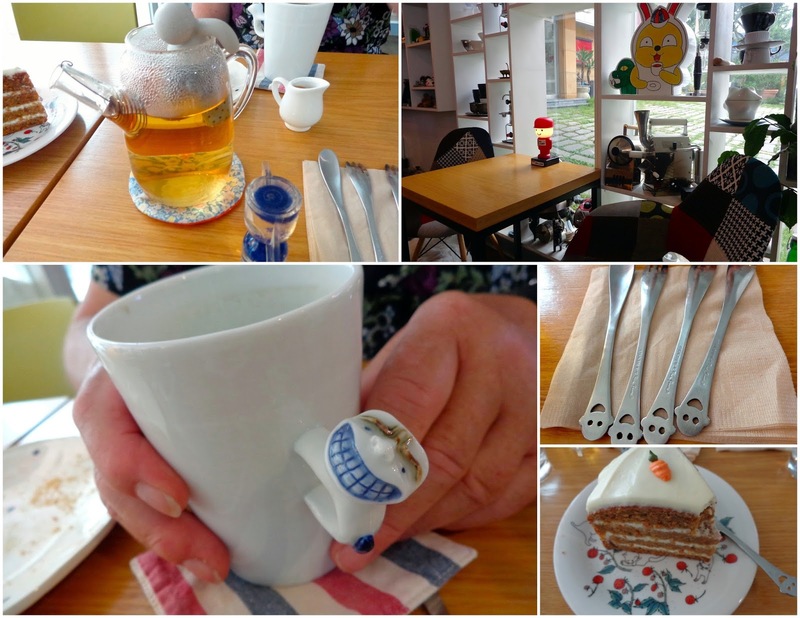 Three kettles of tea were on our table right away, as Charmaine and her family began to order things. You guys, this food was incredible. The best I've had in a long time, and unlike anything I'd previously eaten. All of the "Chinese" food that I've had in the states is so American Chinese food in comparison to these flavors. Wow. Charmaine's dad had some brushes along with him in his backpack, as he had class to teach later that afternoon. He passed them around so we could take a look. While admiring his work, the rest of the restaurant was just as loud as the previous night, though the venue was entirely different - much fancier. In such a full, bustling place as Hong Kong, we quickly learned that efficiency is a high priority. A clear example was in the tables at this restaurant. The table next to us was set just like ours. And then waiters had picked up another "large table circle" and placed it on top of the glasses of the set table. Then they threw on the table cloth and table settings so they now had two set tables ready. 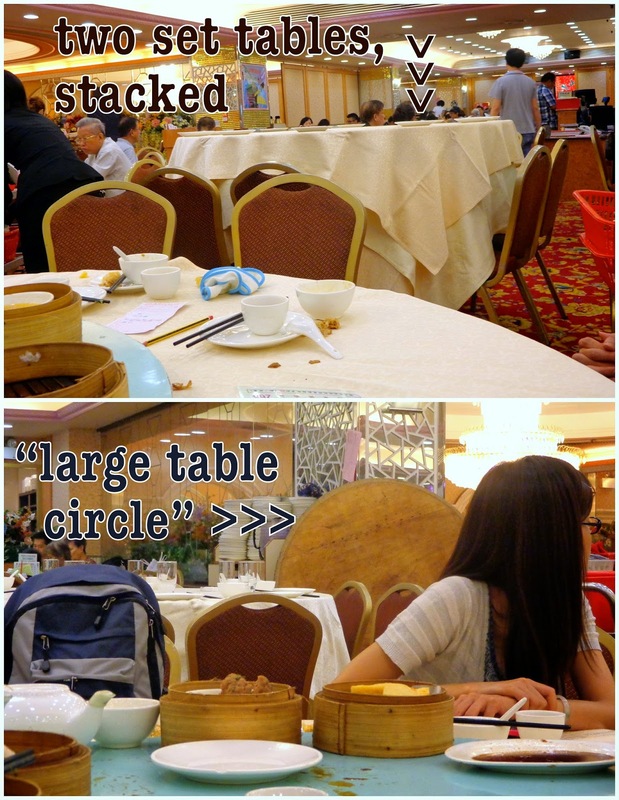 Thus, when a group would finish eating, all they had to do was remove the "large table circle" with dirty dishes, and throw on one of the preset "large table circles". Ta-da! Ready for a new party of 10! It was around 3 p.m. when we couldn't fit another bite into our almost uncomfortably full stomachs. Then one of us shared out loud that we wouldn't be eating any more today - no way, no how. After all, this is what we'd gotten used to doing in Korea: late lunch and perhaps a snack later. "Really?!" asked Charmaine, "But we have the barbecue." "A barbecue?" said Grandma, her tone reflecting the shared thought that eating anything else today was the last thing on our mind. Charmaine's brother laughed and said that Charmaine had prepared a ton of food for this barbecue that would take place at 6 this evening, in just three short hours. A barbecue at the beach had been on the schedule, but there were rumors that it was too hot to have a barbecue today, so maybe there wouldn't be one? I'm sure there were some slight ESL/English miscommunications more than once throughout this leg of the trip. 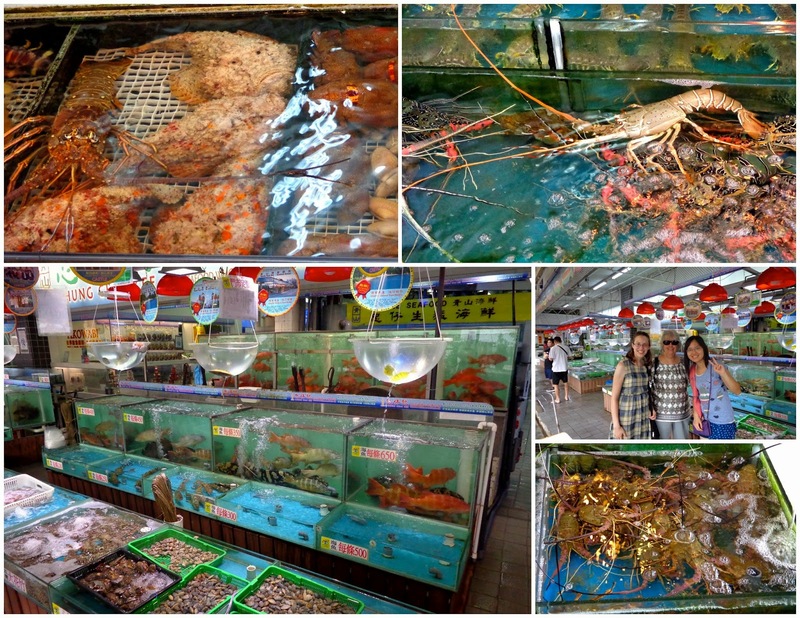 So everyone left the restaurant and split ways; Charmaine's dad went to teach his classes, her family went back to the apartment, and the four of us took a walk to the nearby fish market. The market was a mini version of some of the stand's I'd seen at the Jagalchi Market in Busan. But since there weren't a million people shopping at the stands like the one in Busan, we could slowly make our way down the short strip of tanks. I really liked looking at all of the water creatures - animals that I never see. 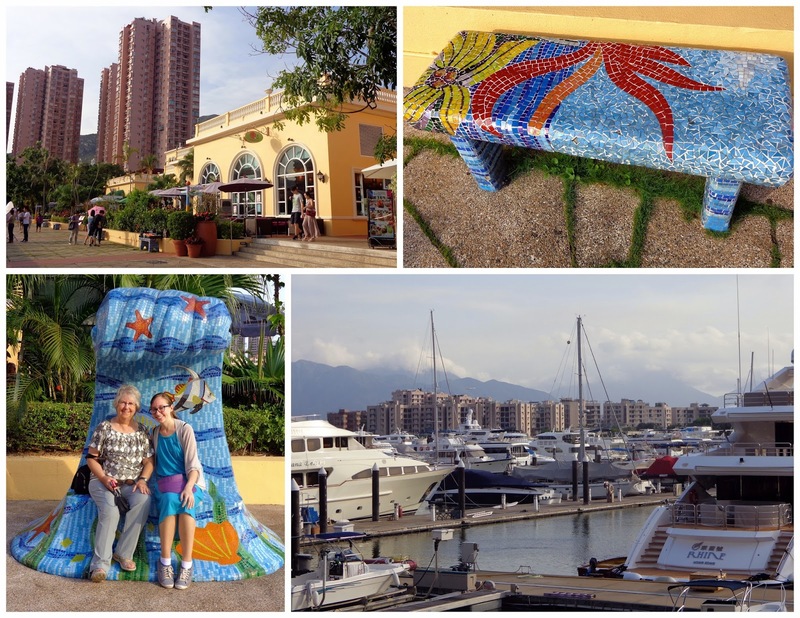 The market was right by the water, so we got to enjoy some nice views before we left the area. We then hopped on a bus for a few stops to a Yacht Club, whose name I'm forgetting at the moment, though it's on the tip of my tongue. Charmaine picked up some ice and a few other last minute things for the barbecue, and then the four of us took a taxi to the beach where her brother had set up. First we had to "clean" the skewers, which reminded me of how chopsticks and glasses were cleaned in tea the previous nights at restaurants. 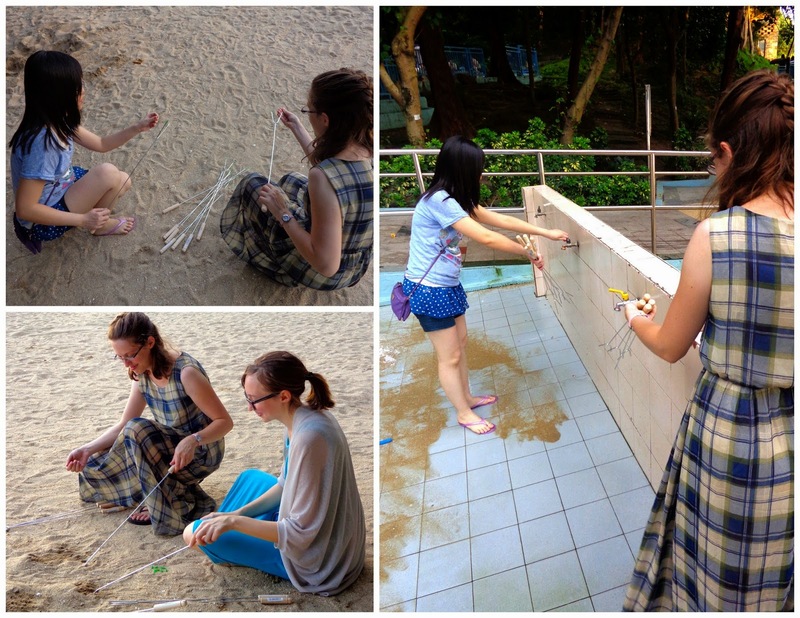 Charmaine instructed us to remove the tip guards from the new skewers, and then push the skewer ends into the sand. We pulled them back and forth, rubbing the skewer against the sand. And then the skewers were rinsed off in water (pictured below, right) before we returned to the fire. Let me remind you that the air was already plenty hot (and still humid). If this were in Wisconsin, you'd think we were crazy to have sat around a fire that evening. We grilled all sorts of things over the fire; some things whose names I don't even know. 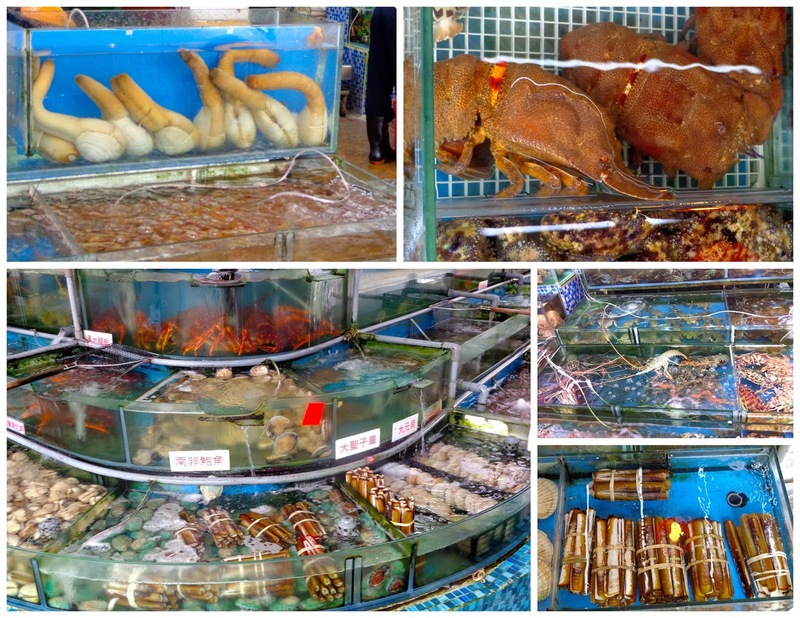 Squid balls, fish balls, corn on the cob, sweet potatoes, tofu, mushrooms, chicken, prawns, and plenty more. It was a slow cook, and when things were almost done, you'd slather it in honey with a brush (pictured above, bottom right) and put it back on the fire for just a minute. 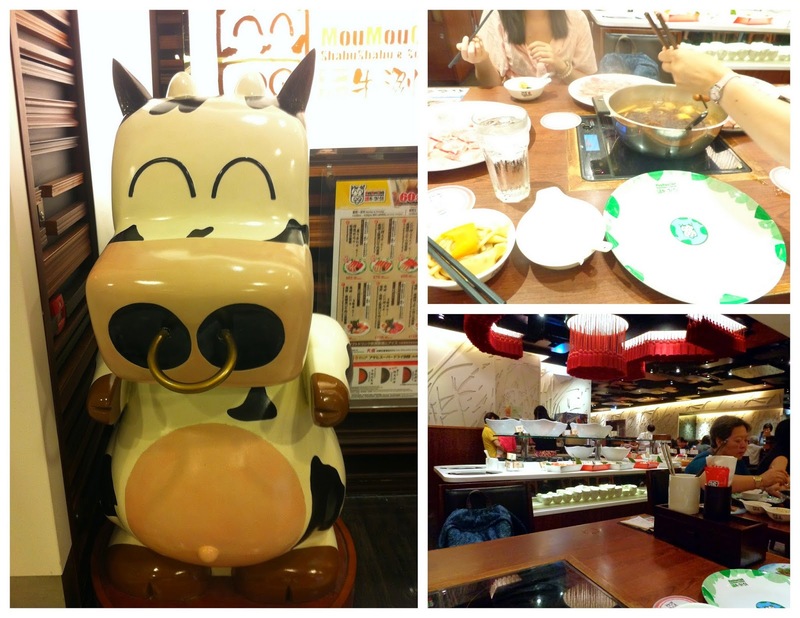 We could not believe how much food there was. All of the family members just kept grilling, and grilling, and grilling. Finally sometime after 21:30 we had to start our journey back into the city. 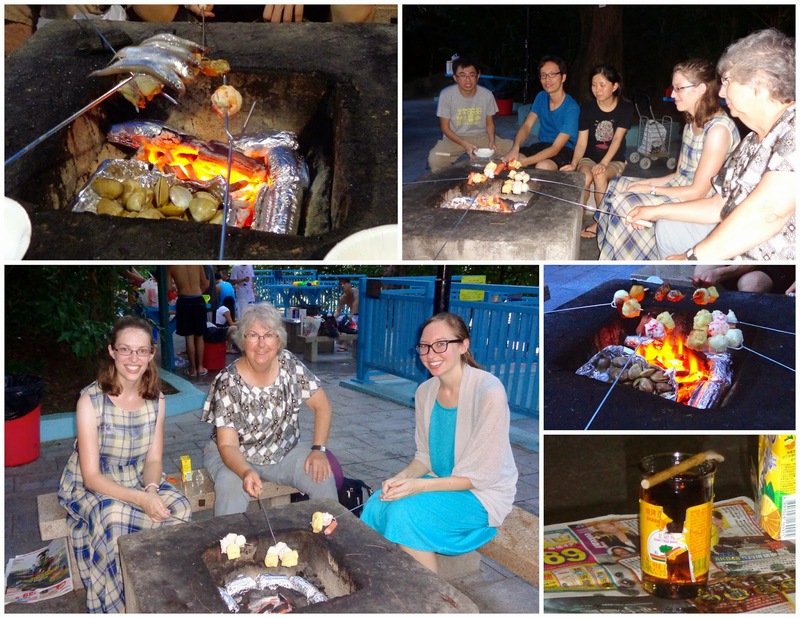 Charmaine's family stayed at the campfire to continue grilling and eating. Charmaine went with us on a bus back to the metro, and then the three of us headed back to our hostel - exhausted and stuffed. An even later night than the previous, we were glad the following day was a blank slate. We could sleep in and take it easy! My sister and grandma came to visit me in Korea during my summer break. We were together from August 8 - 20, 2014. Here are the retellings of Day 1, Day 2, Day 3, Day 4, Day 5, Day 6, and Day 7. We stopped and had breakfast at Dunkin Donuts on our way to the airport. I watched two movies on the flight to Hong Kong: The Other Woman and The Grand Budapest Hotel. Since our hostel said they only accept cash on arrival, just like all of the hostels I've ever stayed at in Korea, Grandma stopped at an ATM in the Hong Kong airport to pull out some money before we found Charmaine. You could only take out $2,500 HKD at a time, so she did that much first, and then did it again. But the second time the transaction was cancelled and the ATM told us to contact the card's bank. So we went out and found Charmaine, my sister's friend from grad school who I was meeting for the first time. She had stayed at our house in Wisconsin for a Thanksgiving, but that was the year I was living in Spain teaching English, which is why my Grandma knew her but I didn't. Her boyfriend Tom had also come to the airport, but he was currently getting money from an ATM. Perfect, we need to take out some more money too! Grandma tried at this other ATM with her card, but it was denied again, as I'd suspected. Jacki offered to take out the remaining cash we'd need for the hostel using her debit card, but I said not to. I'd had recent ATM problems when I was in Bangkok over winter break, and my hostel let me figure things out with my bank and pay the next morning. Luckily, I'd convinced my grandma and sister to go along with my "don't worry" attitude. I was actually really impressed the whole trip at how well they both did at rolling with the punches, like when our hostel in Gwangju was overbooked because they hadn't gotten our reservation. Charmaine and Tom help us buy "octopus cards" in the airport, which is the Hong Kong version of our T-Money cards in Korea, or in other words, a public transportation card. 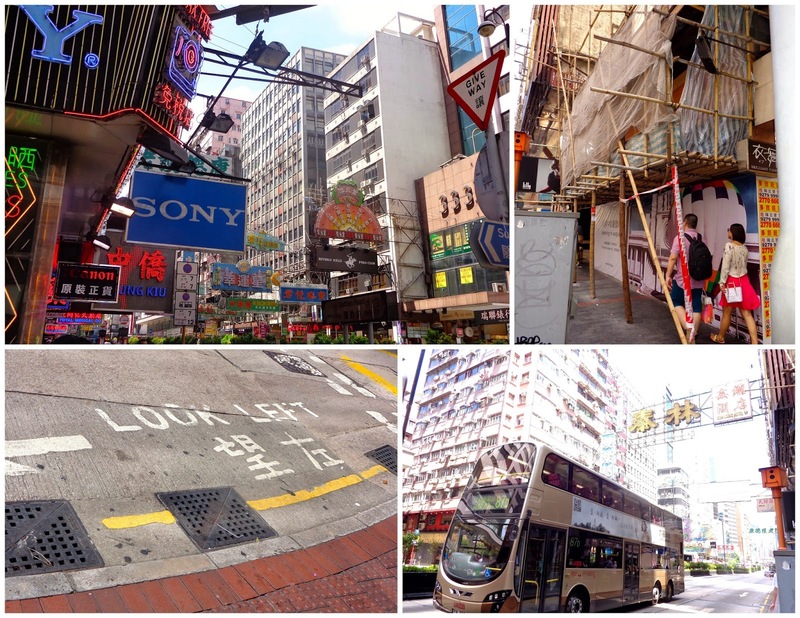 Then we took a bus for about an hour from the airport into Kowloon. 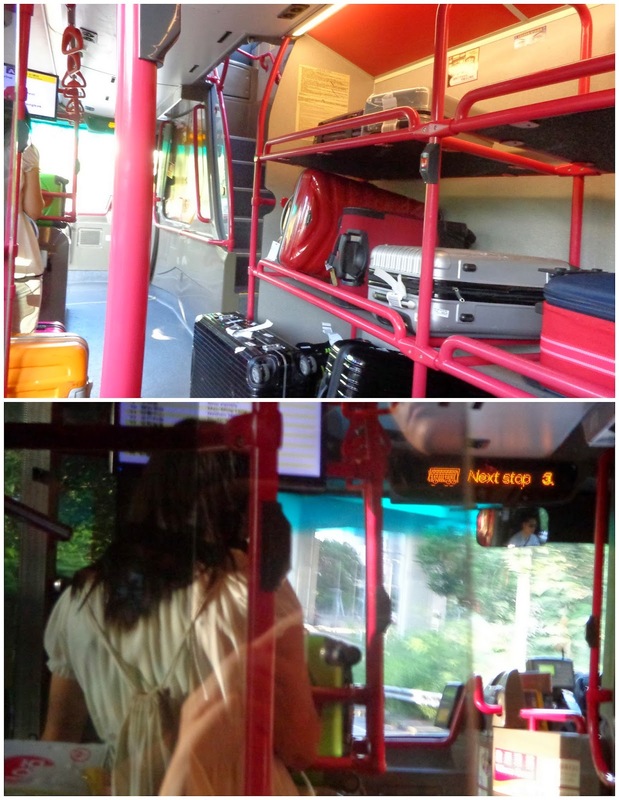 It was a double decker bus, like in London, and since this bus always goes to the airport, there was an awesome place to put luggage during the ride. I loved looking at the mountains on our way, trying to articulate in my thoughts how exactly they seemed different from the Korean mountains I see every day. The apartment buildings we passed were both tall and numerous, and they had a different shape that maximized windows. The hostel wasn't far from where the bus dropped us off, but holy cow was it ever hot and humid. I'd warned grandma and Jacki about the Korean heat before they came, but they'd really lucked out on their visit. Although it was still hot some of the days in Korea, the weather was actually so much cooler than the weeks prior to their arrival. But we weren't that lucky with Hong Kong. After the five of us and our luggage took the elevator up to the 8th floor, we found the hostel with ease. I gave them our name and the woman behind the counter looked through her basket of check-in papers and it was apparent that our name was not in there. What's your confirmation number, she asked me next. I pulled out the sheet and showed her the number. Oh no, did we strike out a second time? Couldn't be, this wouldn't happen twice, not to us (please?). The lady speaks to Charmaine in Cantonese, so the rest of us have no idea what's going on. Then the woman has pulled out a map and is making two marks on it, explaining to both Tom and Charmaine directions to somewhere. While she could have been telling us where another hostel was to try, I wasn't worried. 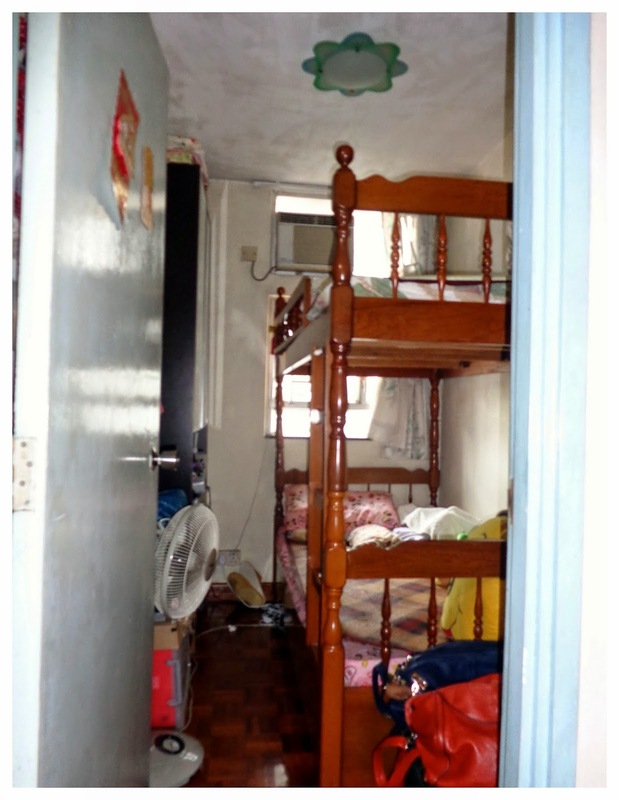 I remembered from reading many Hong Kong hostel reviews online that often a hostel had multiple buildings, so you'd be sent to another building when you checked in. I hoped that's what was happening, and in the end it was. We all went back down - in two elevators because we didn't fit in one - to the first floor and left the building. We followed Tom, who had the map and had heard directions, until we got to a new building. I could feel sweat drops rolling down my legs, it was so so hot and humid. It was at least another 15 minutes of sweating in this building's halls before we actually found the hostel. Long story short, one of the elevators was broken, and the others only went up to different wings - which we didn't realize. So we'd originally gone up to the wrong wing of the second floor, which is why we couldn't see/get to the hostel from there. Tom went off looking by himself as we waited back downstairs, and eventually Charmaine called the hostel's number and someone came down and brought us up. And guess what surprise we had when we went to the hostel? (It's a good one, don't worry.) The hostel asked if we wanted to pay by cash or credit card! Even though the confirmation email had said that only cash is accepted, we were able to pay by credit card, so the cash Grandma got at the airport lasted us the rest of the trip. Most nights in Korea we headed back to our hostel between 5 and 7 every evening and be in for the night. It was nice to have the time to journal, go over daily expenses, escape the heat, and rest. But now it was well past 7:30, after a tiring day of air travel, and we were still going out for dinner. We went back out into the humid heat (even later in the evening, the city of Hong Kong is much hotter than surrounding rural areas) and followed Charmaine and Tom to the metro. We went one stop and walked to Temple Street. 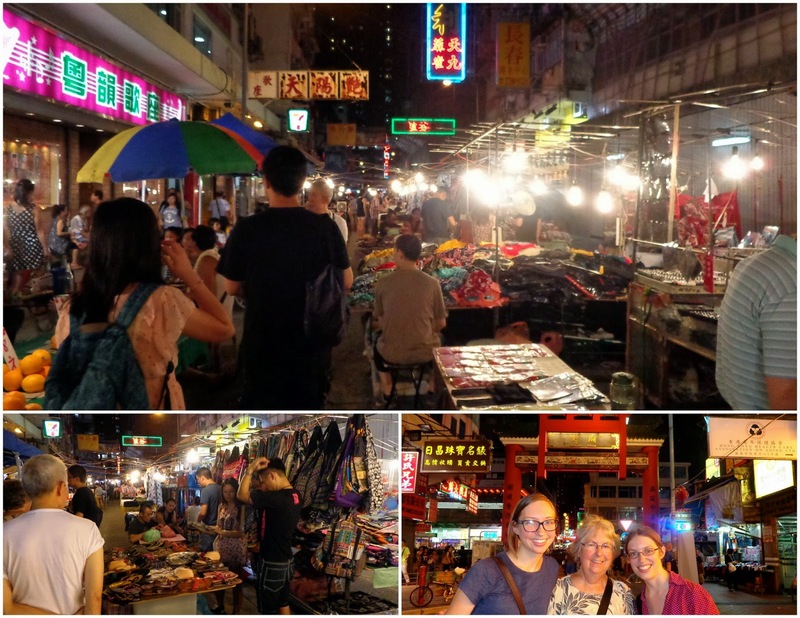 Temple Street is home to a popular outdoor night market in Hong Kong. We were fairly exhausted though, and after having just jammed full packed our bags the previous night, we knew how little space was left and weren't in much of a buying mood. So the walk through all of the stands was a quicker pace than we'd usually have had. After a while Tom turned off to the right and led us into a restaurant. There was no door, an entire side of the joint was simply open to the street. It was noisy and a bit smoky, with a grungy feel all around. But it was authentic and clearly alive. 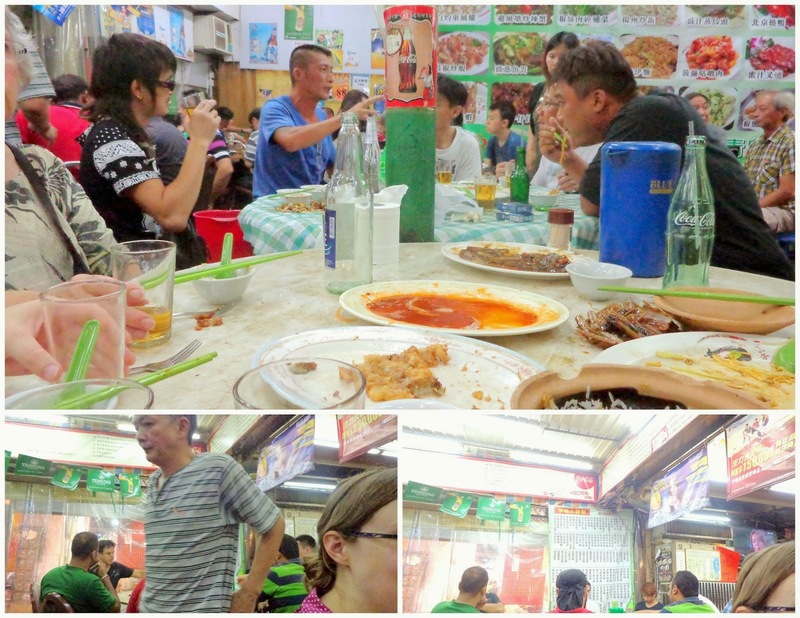 The place was full of locals enjoying food, beer, and animated conversations. We never would have chosen to eat here had we been on our own, so I was already feeling grateful for our Hong Kong "tour guides" - even before we sat down. 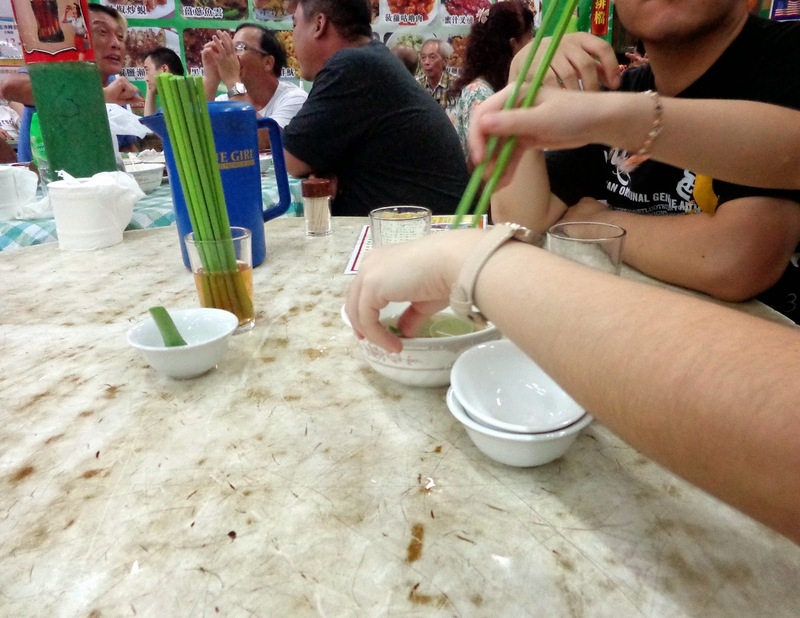 As soon as we did sit down, Charmaine grabbed the metal pitcher sitting on the table and poured a hot, light-brown colored liquid into a glass cup and put all of the plastic green chopsticks inside. She rubbed around the bottom of the cup with the chopsticks, and eventually dumped the liquid out into a bowl. She poured a little more from the pitcher into the bowl, and then put the side of the glass into the bowl, slowly turning it around so that every surface was touched by the liquid. Then she grabbed another cup and did the same, seemingly "washing" it with this liquid and the chopsticks. I asked Charmaine what was in the pitcher. This was not the only time we'd see this done before a meal. Charmaine "washed" all of the cups, bowls, spoons, and chopsticks while we took a look at the menu. Again, I reflected that we would have never known to do that with the pitcher and utensils that were on the table when we arrived. How lucky to have locals showing us around! Charmaine and Tom ordered a bunch of dishes from the menu to share, as is often done in Korea too. The first plate was brought out, and by the time we had nearly finished it, the second dish was ready and slid onto the table. The timing was great like this for the rest of the meal. The flavors were wonderful! 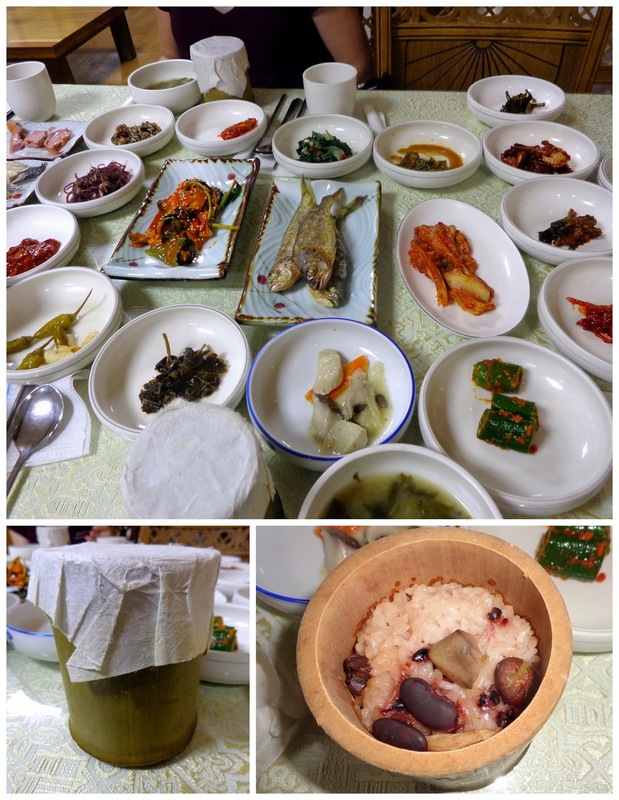 Korean food has variety and flavor, but I'd been eating the same sorts of Korean foods all year. This was quite a change for my mouth, and I loved it! It was nearly 10 by the time we got back to the hostel, so it wasn't long before we were all asleep in our comfortable air-conditioned room. My sister and grandma came to visit me in Korea during my summer break. We were together from August 8 - 20, 2014. Here are the retellings of Day 1, Day 2, Day 3, Day 4, Day 5, and Day 6. The second night of sleep on the hard floor of the traditional Korean house was better than the first night, but nothing like sleeping on a real bed. 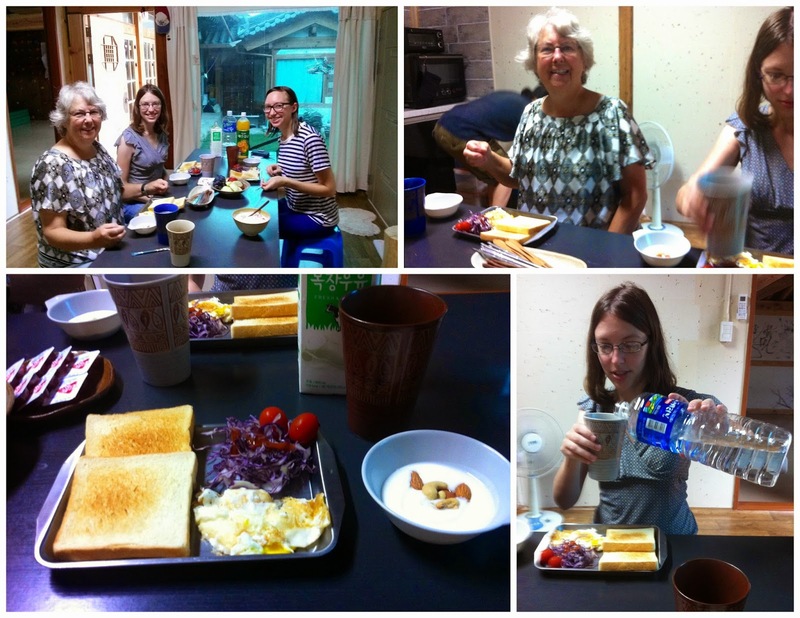 Soon Mi prepared another great breakfast for us this morning, and then had sliced up some fruit and packaged up three sweet potatoes for us to snack on during the train ride - how sweet! She also gave Grandma a painted Korean fan before we said our goodbyes. We had some time before we needed to be at the train station, so we walked around the nearby Art Street for a bit. It began to rain, and although we had two umbrellas between the three of us, a woman across the street signaled for us to take shelter in her gallery. 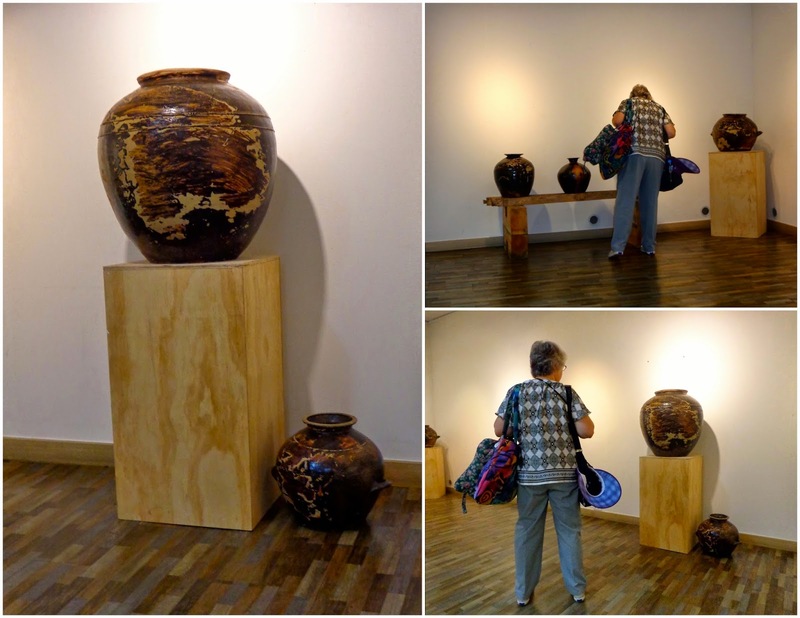 They were displaying handmade Korean pots, which looked the same shape as the big pots used for fermenting kimchi. The rain did not let up while we were inside, so after leaving we soon stopped a taxi and just decided to go to the train station early. While waiting in the station I got to talking with two Mormons while Jacki went to the bathroom. When she came back, the conversation continued between the four of us for over a half an hour before Grandma joined, wondering where we were. But soon it was time to get our tickets from the counter and pick up some lunch to eat on the train. This particular train had more stops (and was cheaper) than the train we had come on, so we wouldn't get back to Seoul until 5 p.m. even though it was just before 1 when we left Gwangju. We were happy to see that we'd been given the same room as before when we re-checked into the hostel. After picking up our luggage from storage, we walked around the corner to find some dinner. 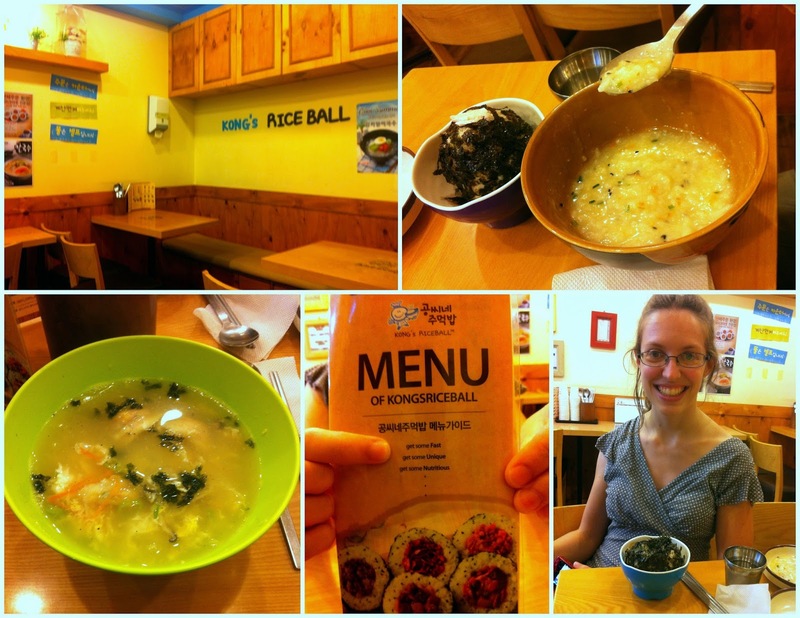 We ended up eating at a place called Rice Ball, which looked like it could easily be a chain, though I've never been there before. The menu was in Korean and English, which never happens anywhere in my town. And after dinner we got cocktails to go that had been advertised at this bar near our hostel every day whenever we walked by. We brought them back to our room to sip on while we packed, since tomorrow was the plane ride to Hong Kong, and we'd need to reorganize the Korean purchases and such to follow baggage requirements. While writing in my journal that night I realized it had already been a week since we'd met up at my elementary school in Mohyeon. Those first 2-3 days had felt so surreal, so strange to be in Korea - a world I've lived in without any of my previous friends or family for almost a year - and now share it with my grandma and sister. Two separate worlds mixing together, it's a feeling that's difficult to describe. But now that a week had passed, we'd gotten into almost a "travel routine," and the days were going by faster. I was glad we'd soon have new surroundings to slow things down again for our final five days together. We slept extra happily on the beds and full pillows that night. 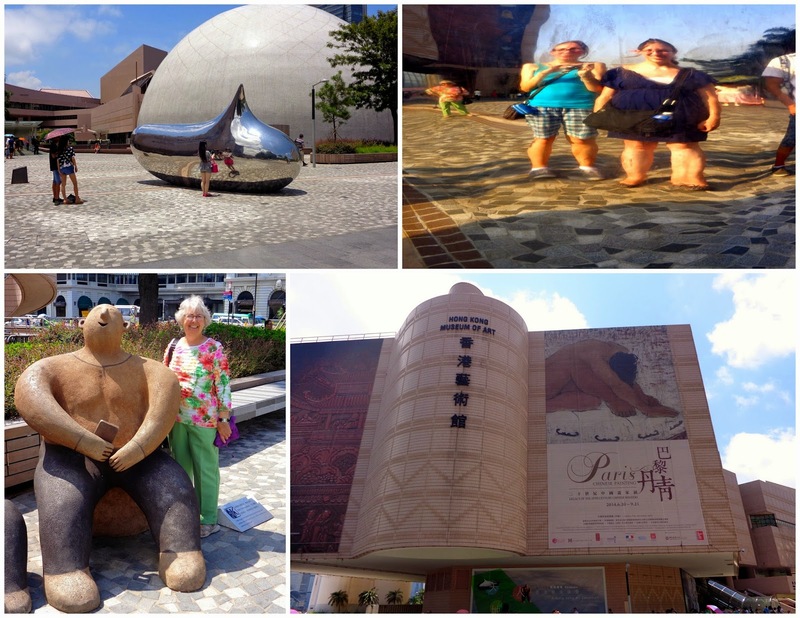 My sister and grandma came to visit me in Korea during my summer break. We were together from August 8 - 20, 2014. Here are the retellings of Day 1, Day 2, Day 3, Day 4, and Day 5. We woke up sore and not well rested after our first night on the floor. Not having a pillow is the toughest part for me, I think. If I'd had one of those little "bricks" they have for pillows at jjimjilbangs, I think I would have slept much better. We went to breakfast at 8:00, as we'd agreed upon with Soon Mi the night before. She'd prepared a lovely breakfast for us! Normally if hostels here provide breakfast, they put out coffee and tea, bread that you can toast yourself, and if you're lucky, eggs that you can cook yourself. Of course, in any hostel, you clean whatever dishes you dirty. But not at this guesthouse! The breakfast here was very much B&B style. 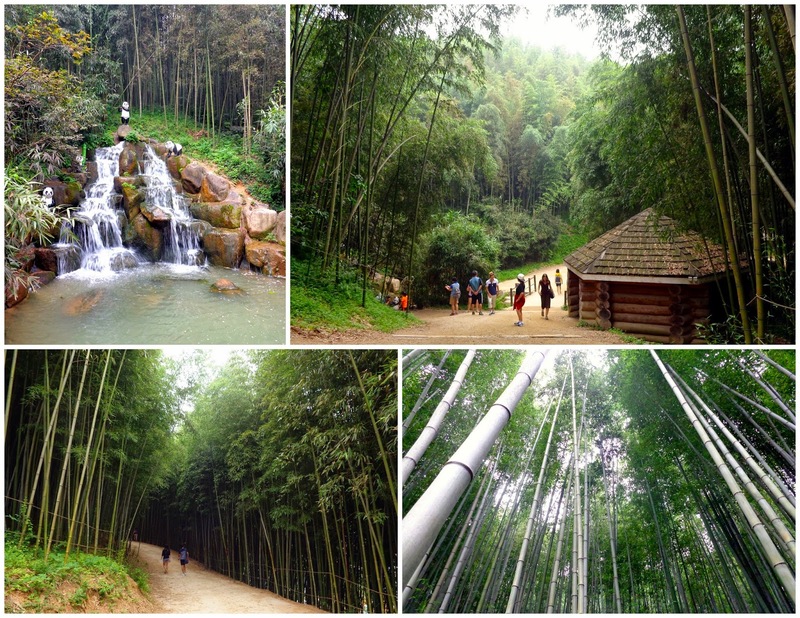 The day before we'd decided on one place to visit today: the Juknokwon bamboo park in Damyang. So we took a taxi to the train station, since it was only just over $3 total, which is right around the total cost of three bus fares anyway. From the Gwangju train station we took a bus about 40 minutes to Damyang. 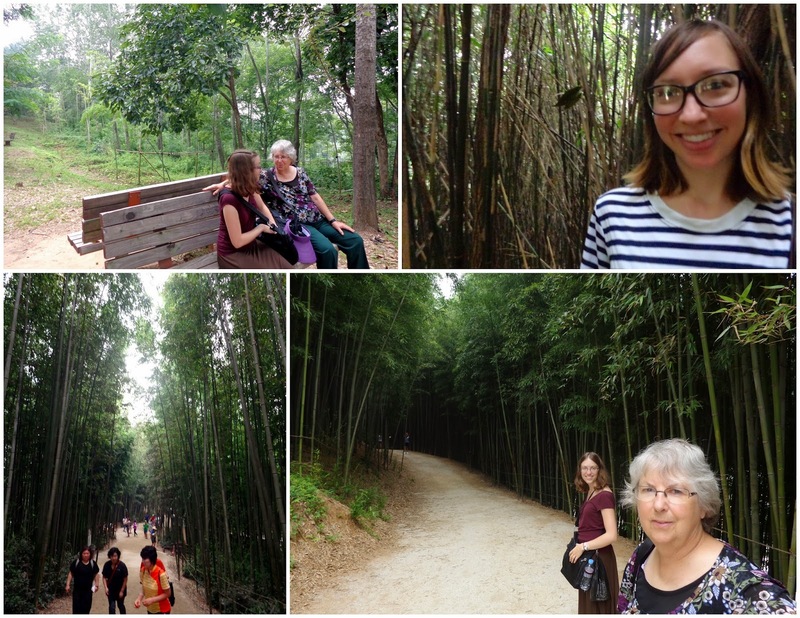 None of us had ever been in a bamboo forest before - what a neat experience. Bamboo is such an interesting plant that I'd never seen in the ground up close and personal. There were many more inclines and hills throughout the forest than we'd expected, so we factored in lots of sitting breaks for Grandma, whose knee was not quite so happy today. We then caught a bus back to Gwangju Station, and another taxi to our general hostel area. On the walk back to the hostel, we decided it was too early to call it a day, and I wanted to check out this cafe where I'd seen a big, fuzzy dog through the window yesterday. So we went into Play Coffee. 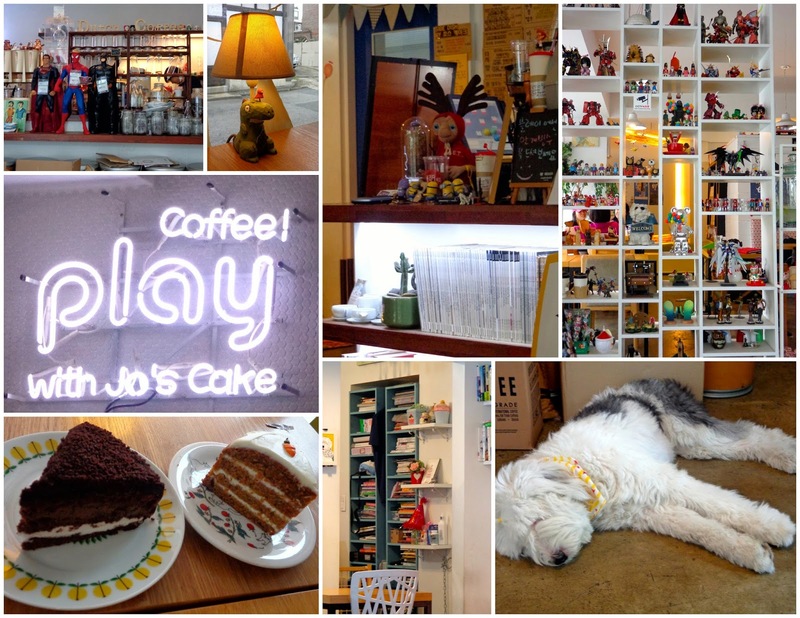 This was another cafe with lots of personality inside... and the dog! We each got a slice of cake, and Jacki had tea while Grandma went for a coffee. The utensils and plates were all so cute and unique! When we got back to the hostel sometime after six, Soon Mi asked about our dinner plans. Oh, we won't have dinner - we're full - and then we tried to explain our late lunch and evening snack/dessert routine that we'd been following this entire trip. It worked rather well for us, but was difficult to explain, as she wasn't familiar with the word "late". Then Soon Mi invited us to have tea with her and her husband in the room just across from ours. It was fermented tea, another "traditional Korean" element of the household. Her husband played for us on some of the Korean flutes he'd made out of bamboo while we all drank tea. This would never have happened at the other hostel! At one point he let us all try to play one of the flutes. It was really hard to get a sound. I got it for a little bit, but when I moved my mouth then I lost the magical spot. We found out that it takes about a year to make each flute, which includes several months for the bamboo to dry. 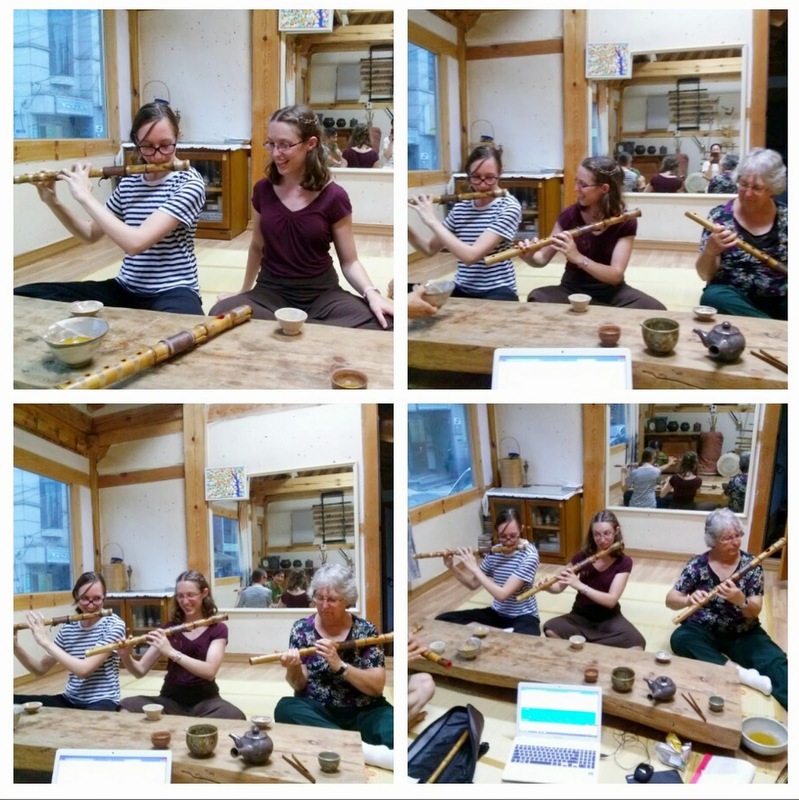 The pieces of bamboo that are used to make these flutes have abnormalities that don't often occur in nature, so those pieces are somewhat rare to find. Soon Mi had her laptop out to look up words and translate them. Throughout tea time and also both breakfasts at the guesthouse, I sort of fell into a translating role between native English and ESL. Grandma or Jacki would ask something like they'd ask a native speaker, because that's just how you talk, so why would they talk any different, and Soon Mi would understandably have a confused look on her face. I'd rephrase the question into very simple words while speaking slowly and making lots of hand motions. Sometimes I served as a translator the other way around, from Korean English into native English, as I'm used to hearing English through a Korean accent, so I could make out what Soon Mi and her husband were trying to say when Grandma and Jacki couldn't. If you've never done it before, talking with people who speak ESL (English as a Second Language) is entirely different from conversing with a native speaker, especially at lower levels. I've been doing it for years, so I had forgotten that it's not something everyone knows how to do. 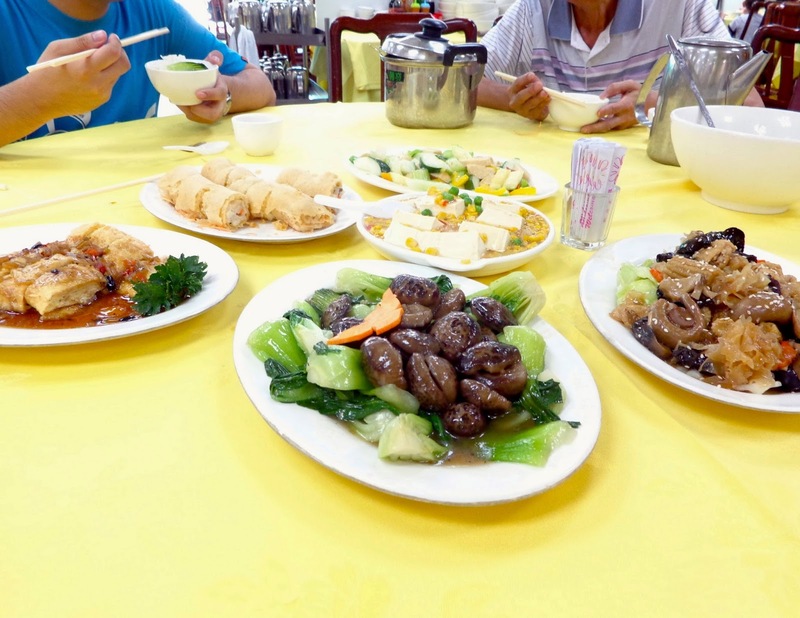 I would often be surprised at the way Grandma or Jacki spoke with our hosts, thinking "oh no, too many colloquial words," or "that question is too complicated to ask," while we did our best to communicate over tea. With low level ESL speakers, you can't say things like, "I could just pass out right now," you say, "I'm really tired." Instead of, "Ok, suit yourself," you say, "Ok." And all of the ways you could use tone and wording to gently tip toe around more delicate topics are out the window. If you say "it's fine" with a tone that clearly shows it's not fine at all, that you'll just have to put up with it, the ESL speaker will think that it is indeed fine. So you must be clear and direct, which isn't always the most comfortable or enjoyable, but beginner/intermediate and even some advanced ESL speakers generally won't pick up on any meaning apart from the literal - so it's a necessity if you want greater understanding. You definitely get used to speaking this way over time, but it can be unfulfilling to simplify every situation all of the time, not accurately describing what's actually going on. As seen in some of the examples above, speaking this way does cause you to lose meaning and limits what you can express, which is a huge part of what led to my huge frustrations and gloom back in February, since 96% of my communications in Korea were in ESL and not native English. But back to the tea, which was coming to a close now anyway. When it appeared that things were wrapping up, Soon Mi inquired again about our dinner plans, and we reassured her that we were full and had eaten recently. Then she and her husband left for dinner, so we think they would have invited us along if we hadn't had a late lunch and the cakes at the cafe. 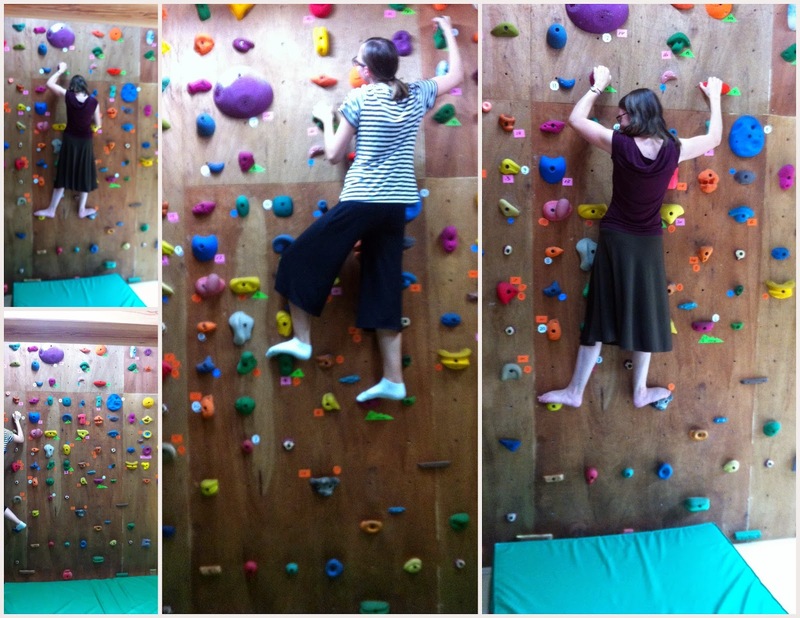 Jacki and I spent a brief amount of time on the rock wall, as we were both giddy to try it and Soon Mi had said we were welcome to use it - any of the rooms in fact - any time. Yet our arms couldn't hold us up for more than a couple tries at the different paths marked on the wall, which accounts for the short amount of time in there. Oh, and right before they left Soon Mi brought in three small inflatable pillows: two neck pillows and one small rectangle, and apologized for forgetting to bring them in yesterday. I'm assuming it's not often at all that she has foreigners stay in that room, and I wondered if she'd gone out and bought these pillows today. Either way they were much appreciated, and made the second night's sleep better than the first - though we were all looking forward to sleeping on a real bed the next night.